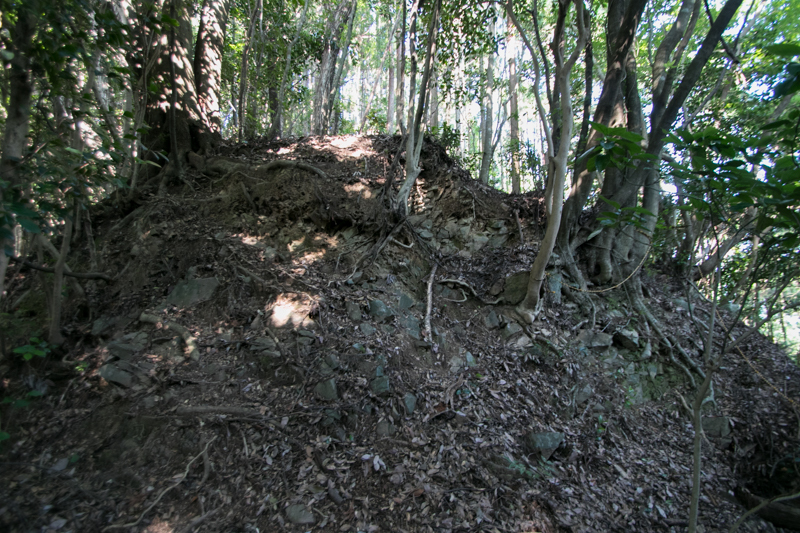 Togamure Castle (栂牟礼城) is built over Togamure mountain, one of about 200 meter height from hillside at 3 kilometer west from current Saiki city central. 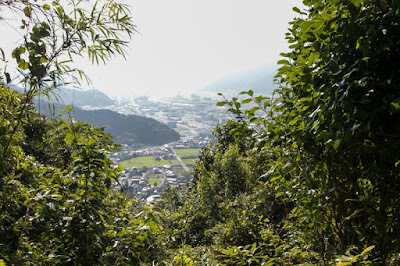 Saiki area is a small flat area at the south of Bungo province (Oita prefecture) formed by Banjo area, and a good port at the inside of Saeki bay. 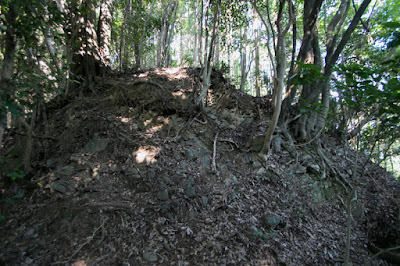 Togamure mountain stands at the meeting point of the main stream of Banjo-gawa river and its tributary Izaki-gawa river and Kurusu-gawa river. 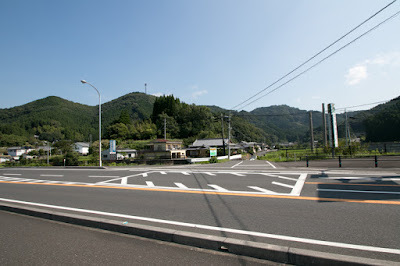 As Izaki-gawa river is used as a inland road toward inner part of the province such as Bungo-Ono city or Takeda city, and a mountainous road toward Hyuga province (Miyazaki prefecture) runs along Kurusu-gawa river, Togamure area is an important place of communication where these inland roads and coast roads from Usuki area or Nobeoka area. 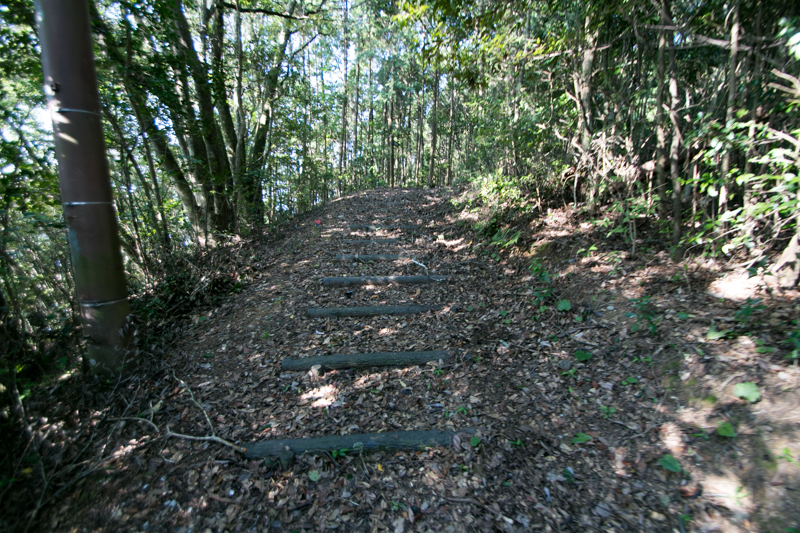 Togamure castle was built in 1521 by local lord Koreharu Saeki (1495-1527). The origin of Saeki clan is unknown but might lived Saiki area from 10th century and grew to major local lord in medieval era. 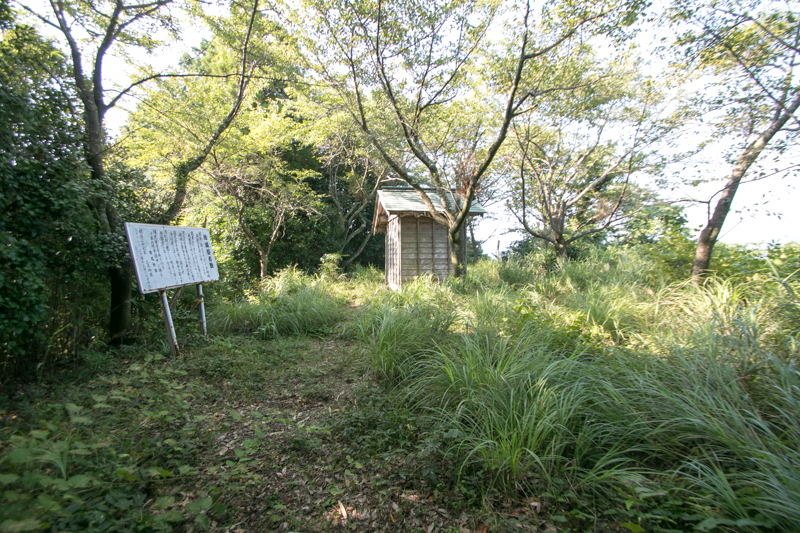 Saeki clan followed Otomo clan which was appointed as the governor of Bungo province, and fought against Ouchi clan along with Otomo clan. 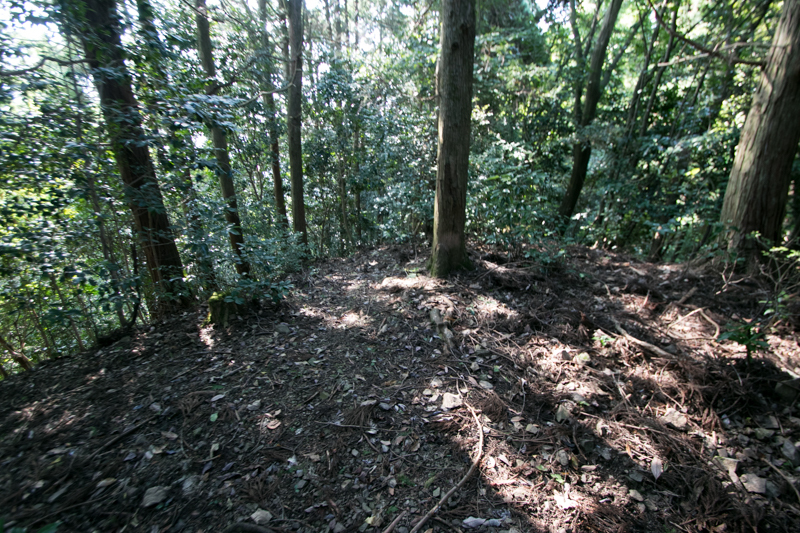 At the beginning of 16th century, Otomo clan ceased its internal conflicts and started to grow as a strong warlord under Yoshiaki Otomo (1502-1550). At this time, Saiki clan also established as the local lord of Saiki area under Koreharu Saeki, and worked as the guard of Otomo clan at its south border. 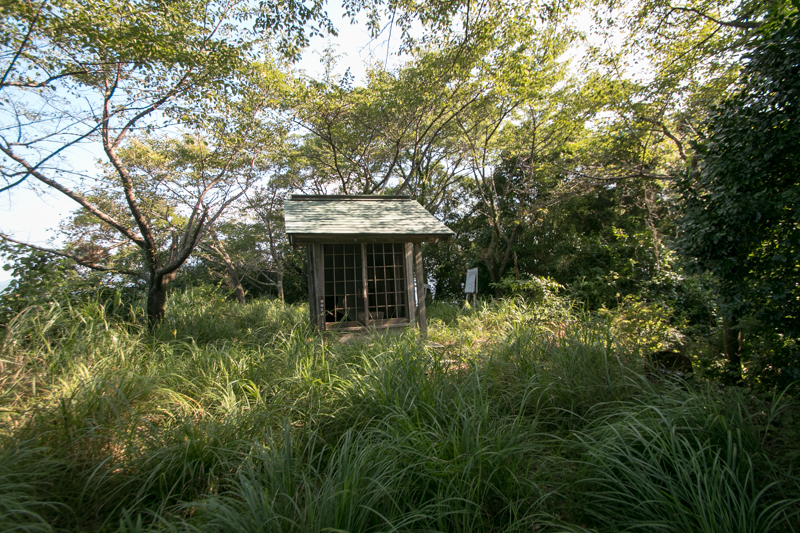 Centered on newly built Togamure castle, Saeki clan held branch castles over Saiki area. 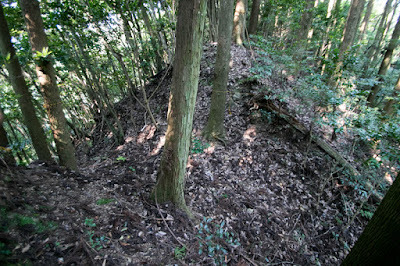 However, under a slander that Koreharu attempted a rebel against Otomo clan, Yoshiaki Otomo ordered its retainer Usuki clan to subjugate Koreharu. 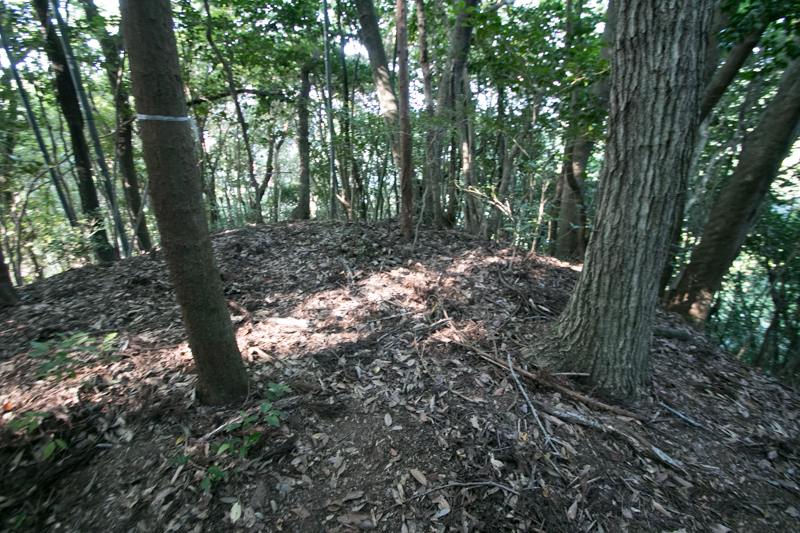 Koreharu besieged Togamure castle and rejected the attack of Usuki clan, but Koreharu was lured out by a plot and finally killed. 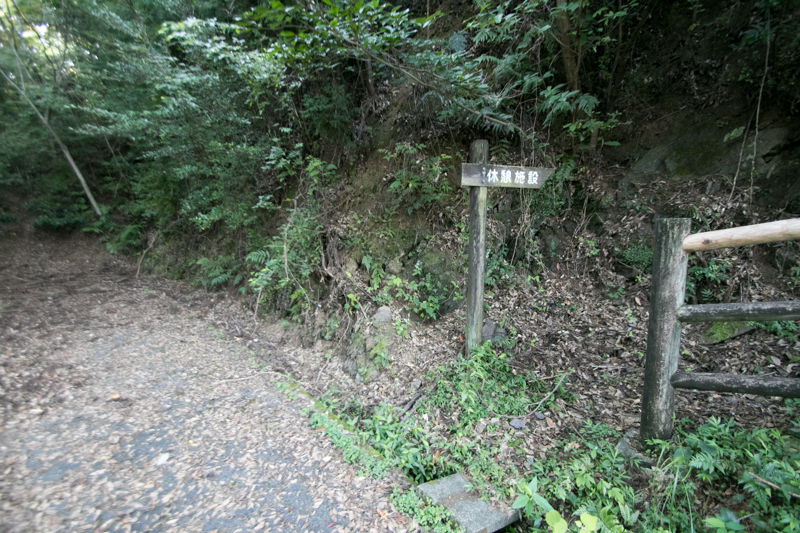 The position of leader was succeeded by Korenori Saeki (?-1578). 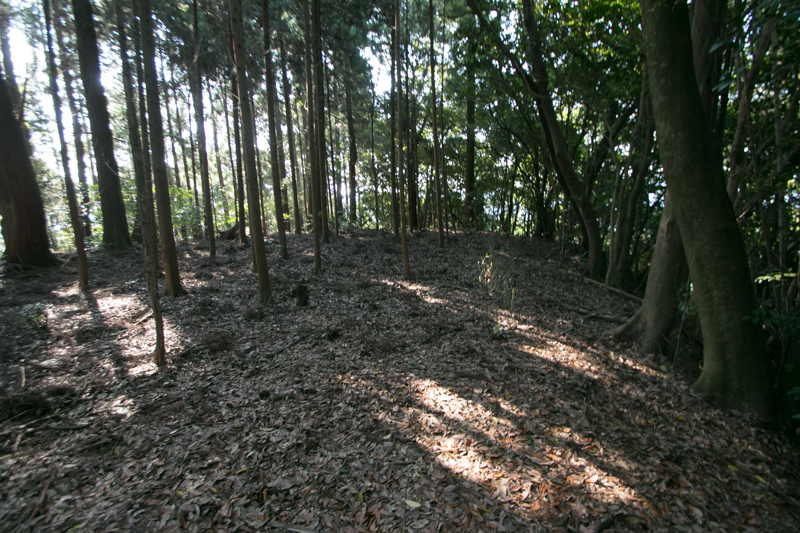 In 1550, after the incident of Nikai-Kuzure, a substantial coup d'etat, Yoshiaki Otomo died by injury and his son Yoshishige Otomo (1530-1587, known as his Buddhist name Sorin) became the leader of Otomo clan. Once Korenori Saiki became opponent Yoshishige Otomo and left Bungo province, but later returned and became an important retainer of Otomo clan. 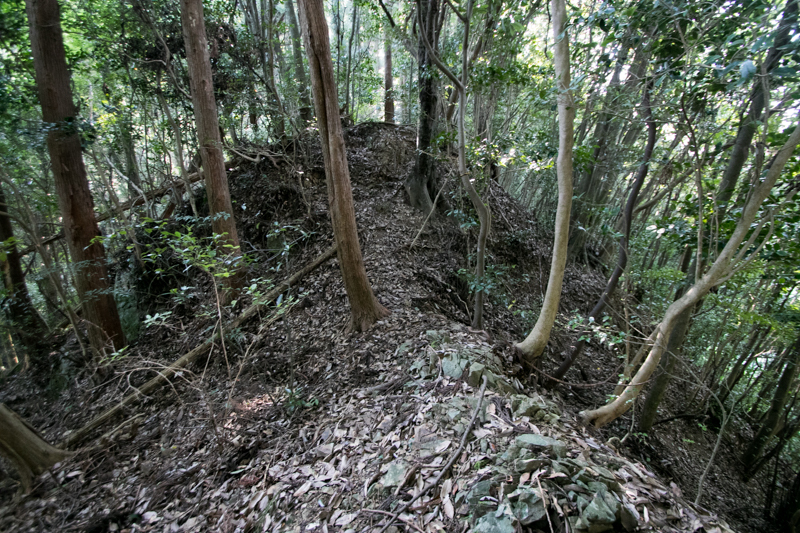 Under aggressive leader, after long time conflict against Ouchi clan or Mouri clan, Otomo clan became the ruler of Kyushu island which directly or indirectly held most part of north half of the island around 1560. But relationship of Yoshishige and important retainers was not stable then rebel of important retainer frequently occurred. 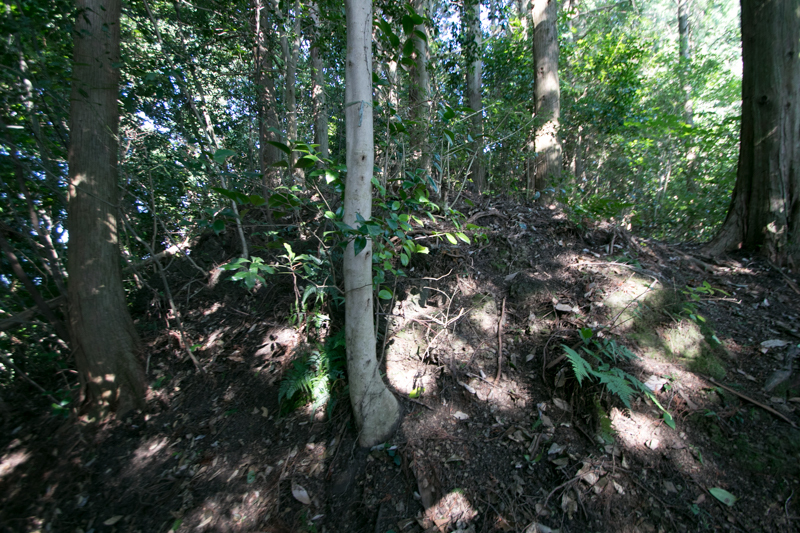 Yoshishige also left military commands to important retainers, and a clear chain of command was not established in the clan. 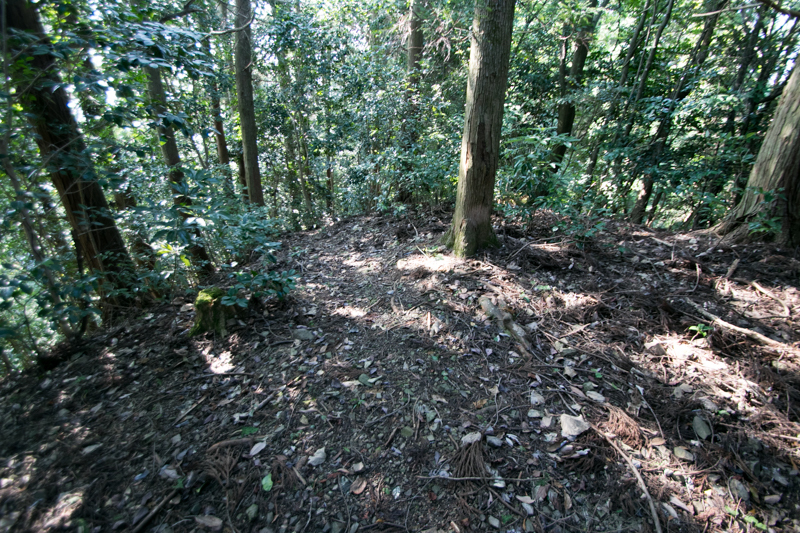 Furthermore, Yoshishige became a eager Christian, but too hasty enforcement of Catholic ignoring traditional religion became a source of serious discord in the clan. Besides, after the retire of Yoshishige in 1576, there occurred a diarchy of Yoshishige and his son Yoshimune Otomo (1558-1610). 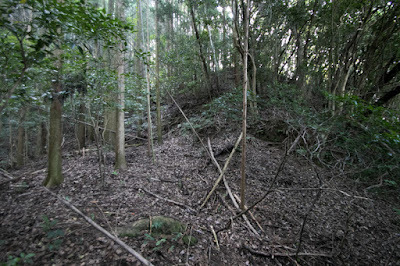 Under such situation, in 1578, Ito clan which was the governor of Hyuga province (Miyazaki prefecture) but lost the territory facing the attack of Shimazu clan, which was the lord of Satsuma province (Kagoshima prefecture), asked assistance to Otomo clan. 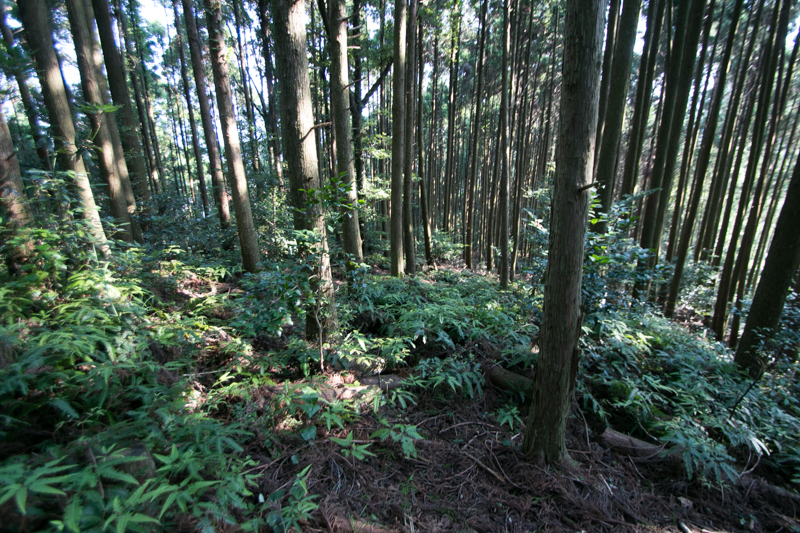 Utilizing this opportunity, Yoshishige attempted to build a Catholic kingdom at Hyuga province then sent large army. 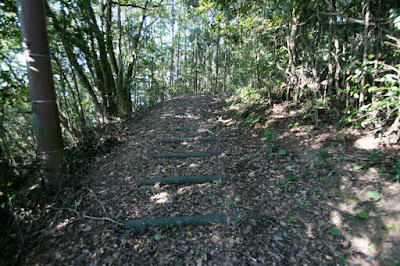 Otomo army entered Hyuga province ruined Tsuchimochi clan which was the lord of Matsuo castle turned to Shimazu clan, and next encircled Takajo castle which was held by Takanobu Yamada (1544-1609), a brave general of Shimazu clan. 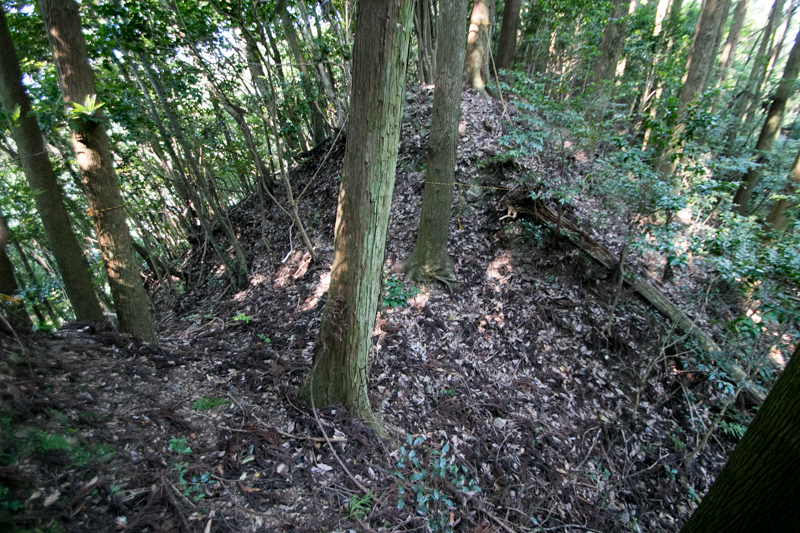 Shimazu army only had a quite limited number of soldiers, but kept Takajo castle and waited for the reinforcement. In October, Shimazu clan sent their all army lead by their leader Yoshihisa Shimazu (1533-1611) and brave brothers such as Yoshihiro Shimazu (1535-1619) and Iehisa Shimazu (1547-1587). Adding reinforcement army Shimazu army were lesser than Otomo army, but they had a clear tactics and command line, On the other hand, Otomo army was larger than Shimazu army but lacked moral because of religions matter, and also single command line. 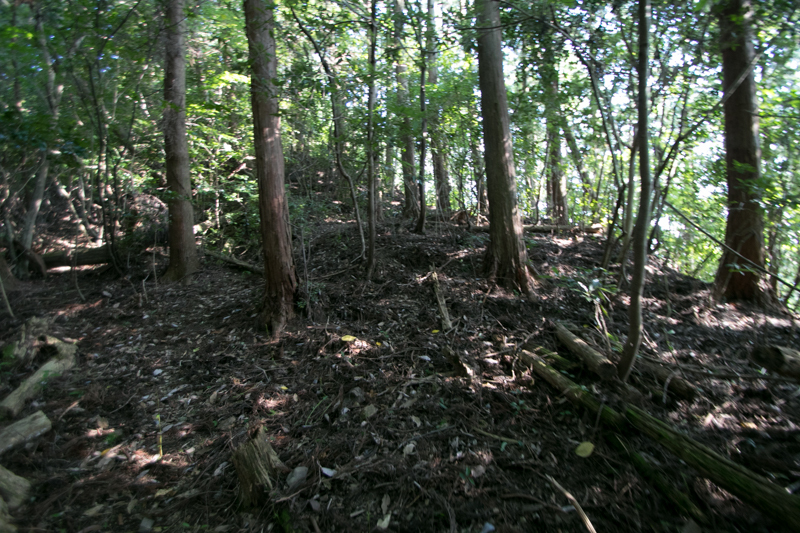 Finally both army faced at the both side of Takaki-gawa river. 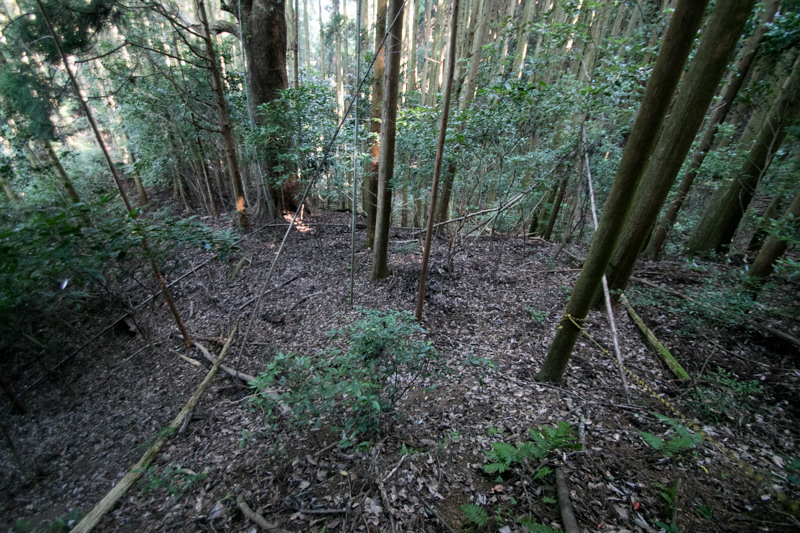 As Otomo army lost a skirmish battle, Shigechika Takita (1543-1578) and Korenori Saeki forcefully charged into Shimazu army to encourage Otomo army. 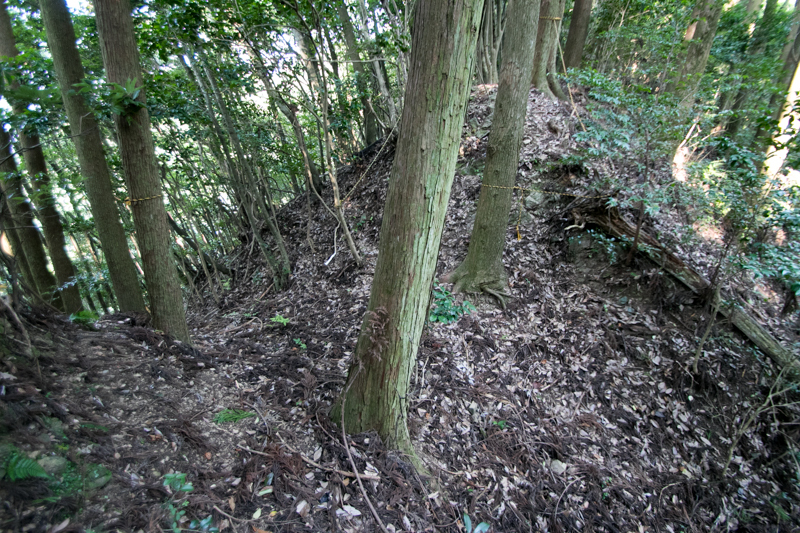 Two generals broke the vanguard of Shimazu army, but was attacked at the moment of too much protrusion and ruined. Korenori Saeki in the battle, and Otomo army collapsed with loss of generals and soldiers. 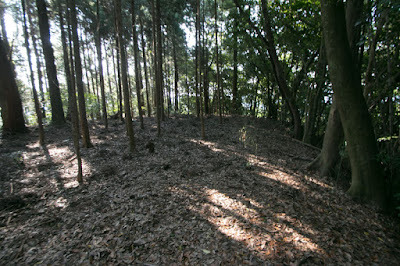 After this battle of Mimikawa, Otomo clan significantly lost its power and authority. 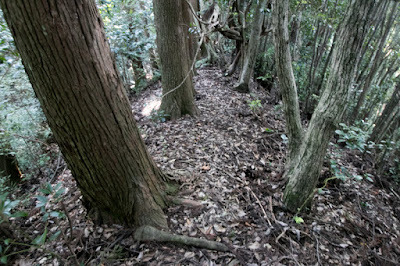 Takanobu Ryuzoji (1529-1584) who was the lord of Hizen province (Saga prefecture) nominally followed to Otomo clan became an independent lord and deprived the territory of Otomo clan, then there occurred the confrontation between Otomo clan, Shimazu clan and Ryuzoji clan. 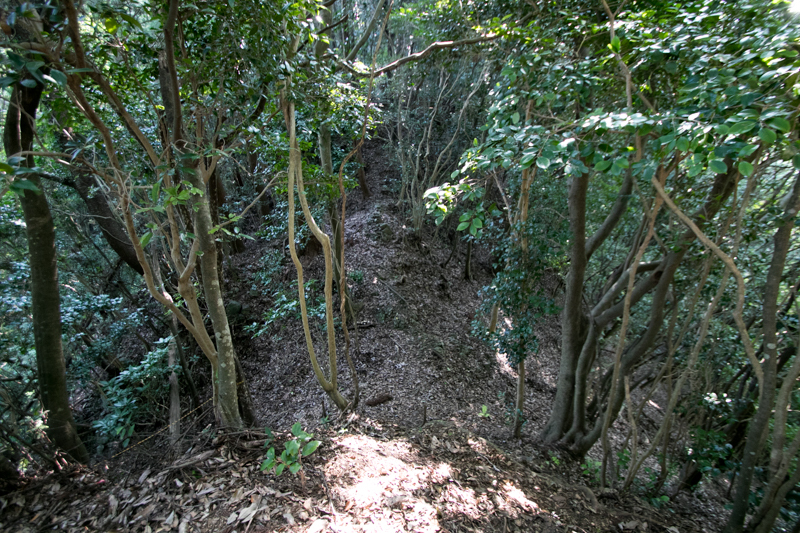 Ryuzoji clan once captured most part of north part of Kyushu island, but suffered severe defeat before Shimazu clan at the battle of Okitanawate in 1584 and lost its leader Takanobu Ryuzoji. 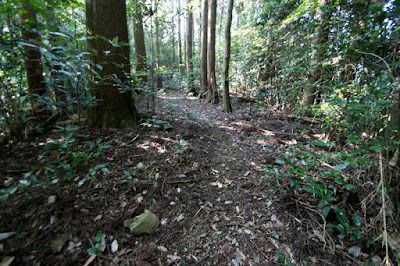 Ryuzoji clan followed to Shimazu clan, and Shimazu clan became the ruler of Kyushu region. 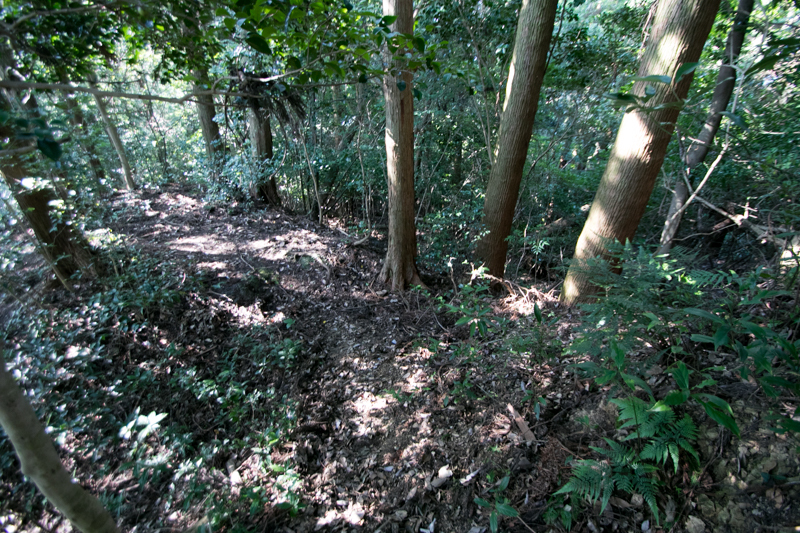 On the other hand, Otomo clan significantly lost its power by rebel of important retainers, and loss of its important retainer Dosetsu Tachibana (1513-1585) who desperately supported declining Otomo clan by ill.
Yoshishige Otomo who could not compete with Shimazu army any more asked assistance to central ruler Hideyoshi Toyotomi (1537-1598). 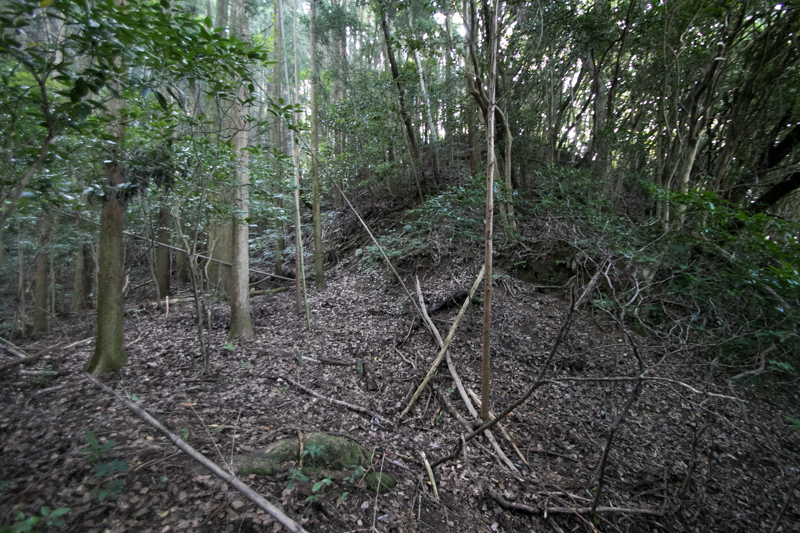 On the other hand, Shimazu clan felt a capture of Kyushu island before arrival of Toyotomi army and accelerated the invasion to Otomo clan. 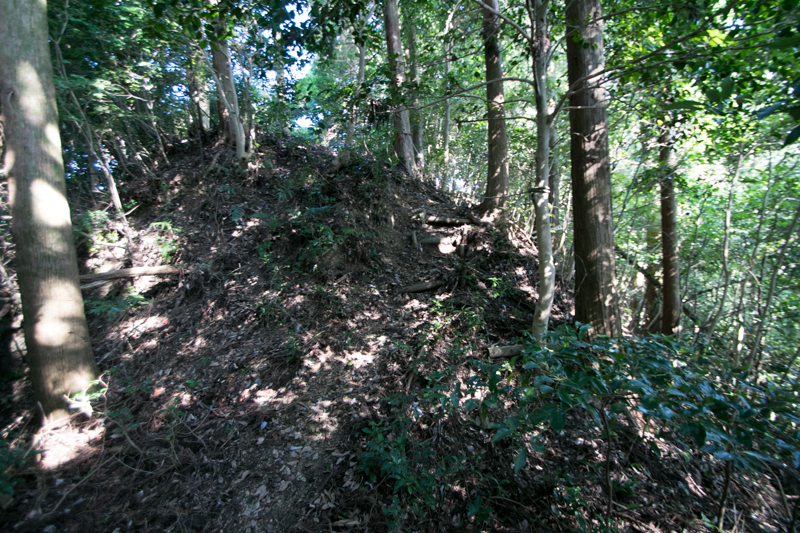 In the summer of 1586, Shimazu army sent large army to Chikuzen province, and by the desperate resistance of Joun Takahashi (1548-1586) at Iwaya castle (Fukuoka prefecture) and support of Toyotomi army Otomo clan barely kept the territory but lost its economic resource Hakata city and support to Bungo province. 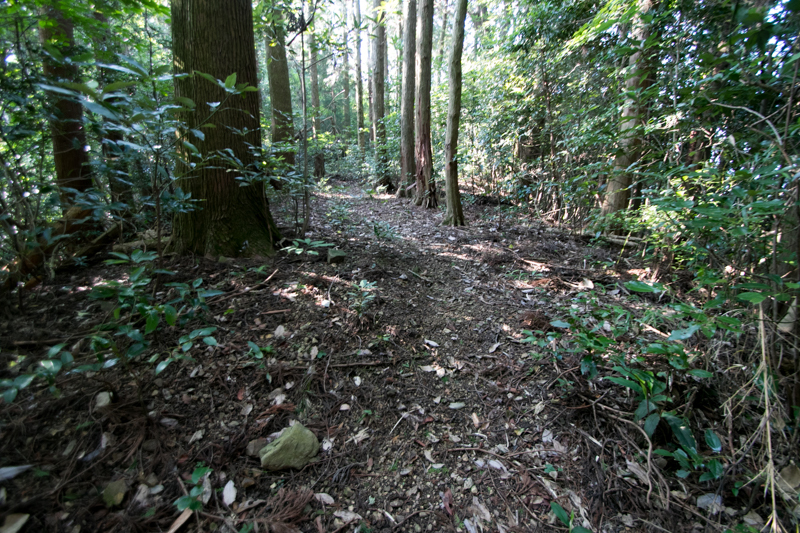 Next in the autumn of that year, utilizing the turn of important retainers of Otomo clan, Shimazu army started its decisive operation against Otomo clan. 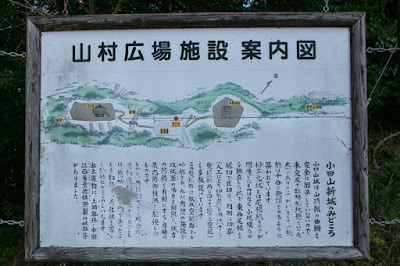 The main army of Shimazu clan lead by Yoshihiro Shimazu marched from Higo province to the western border of Bingo province, and detached force commanded by Iehisa Shimazu headed from southern border to Saiki area. Facing the invasion of Iehisa Shimazu, Koresada Saeki (1569-1618), the grandson of Korenori Saeki and leader of Saeki clan, declined an advice of surrender as Koresada lost his grandfather and father at the battle of Mimikawa, then strengthened Togamure castle and branch castles. Koresada also hired Munemasa Yamada (1544-1620), a brave general of former Ito clan who broke Shimazu army several times. 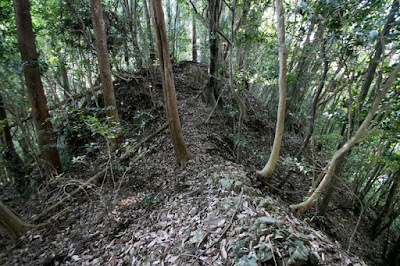 Core part of Togamure castle spreads over a ridge from its peak to southward. 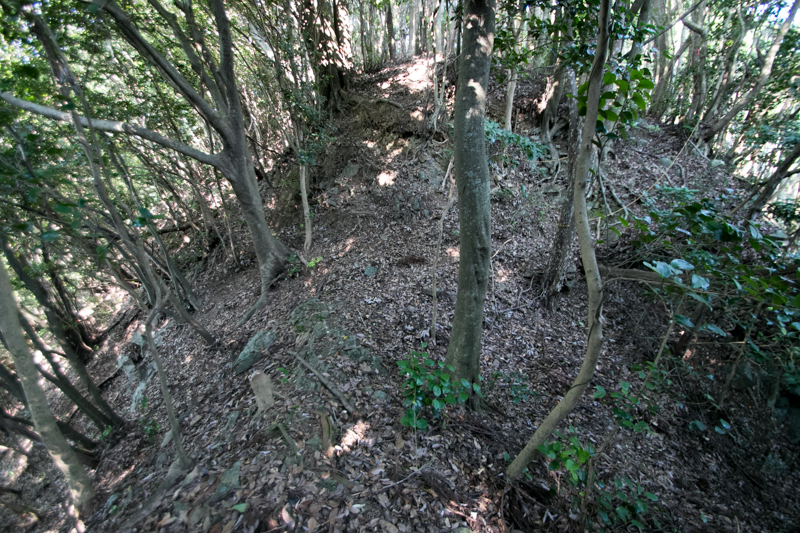 Central area of the castle is an oblong area of 30 meter long and 10 meter wide, having a lower terrace of same size at southward. 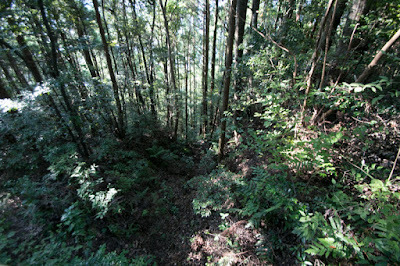 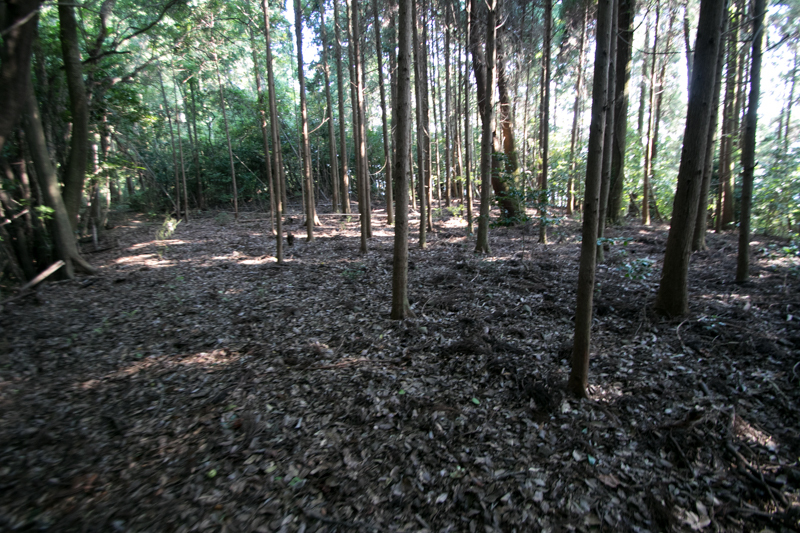 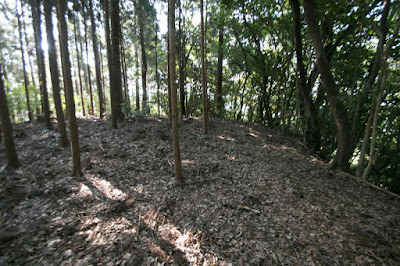 Ahead of several small terraces, there is a large secondary area of about 80 meter long and 30 meter wide. This part consist of simple flat area and might keep original plan of the castle. As a gentle ridges spread toward southeast and southwest from the south edge of secondary area, these ridges are protected by layers of dry moats. 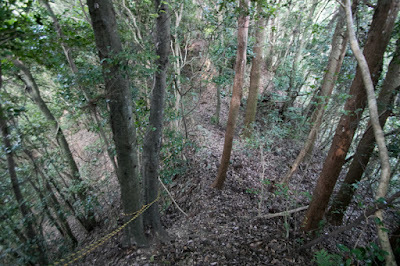 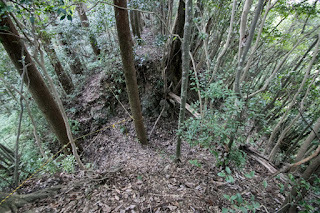 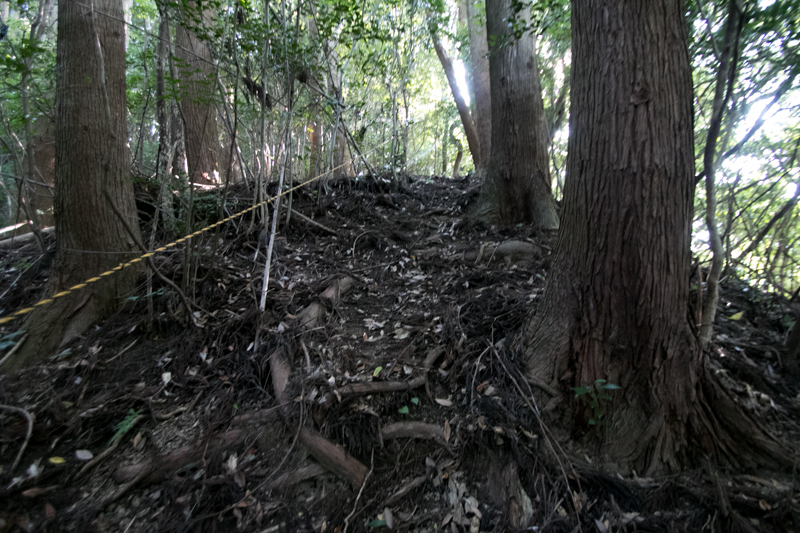 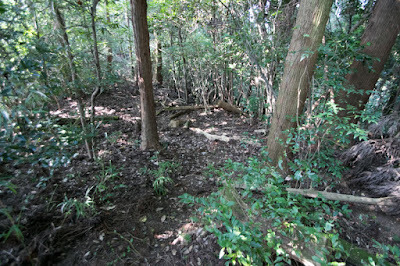 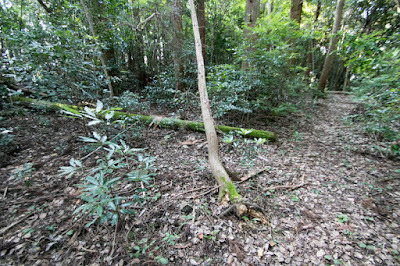 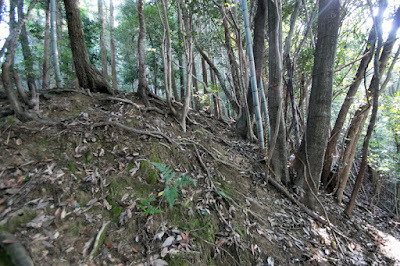 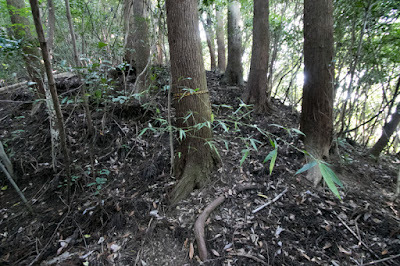 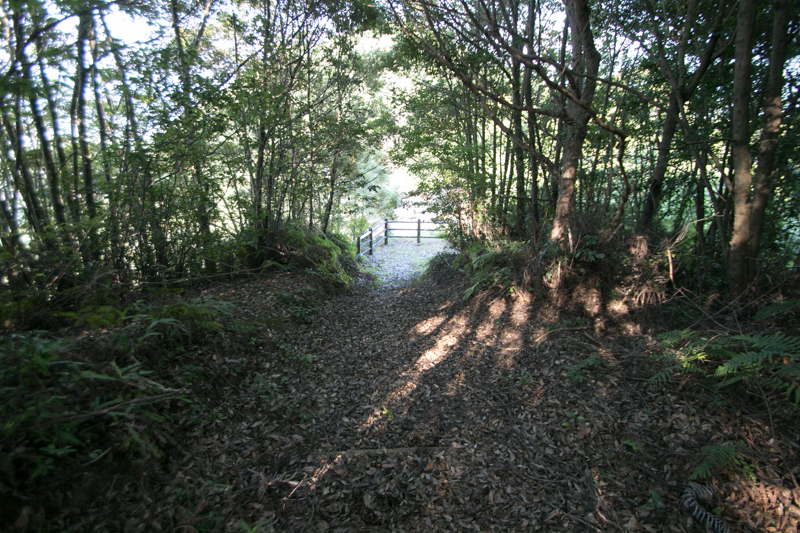 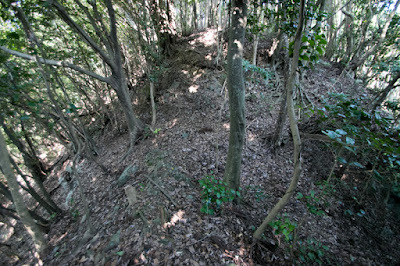 Especially southwestern ridge is connected to the next hill, this ridge is securely guarded by combination of six dry moat. 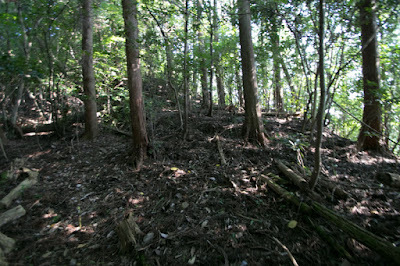 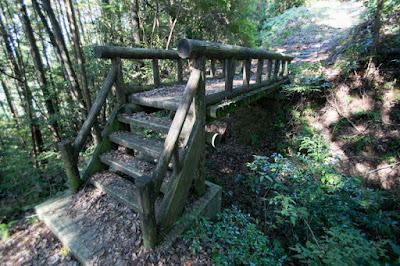 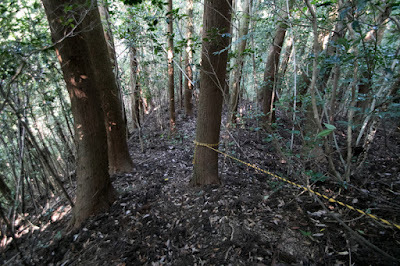 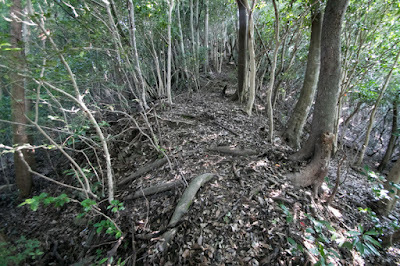 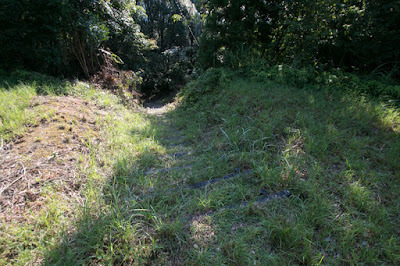 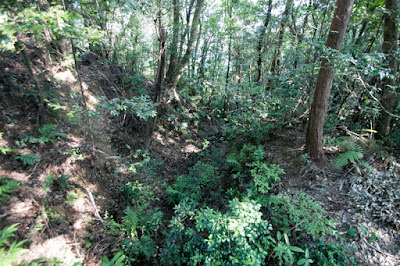 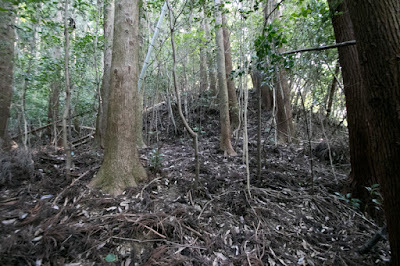 Especially the most outside moat is a huge one of about 20 meter wide and 10 meter depth, having a narrow clay bridge. 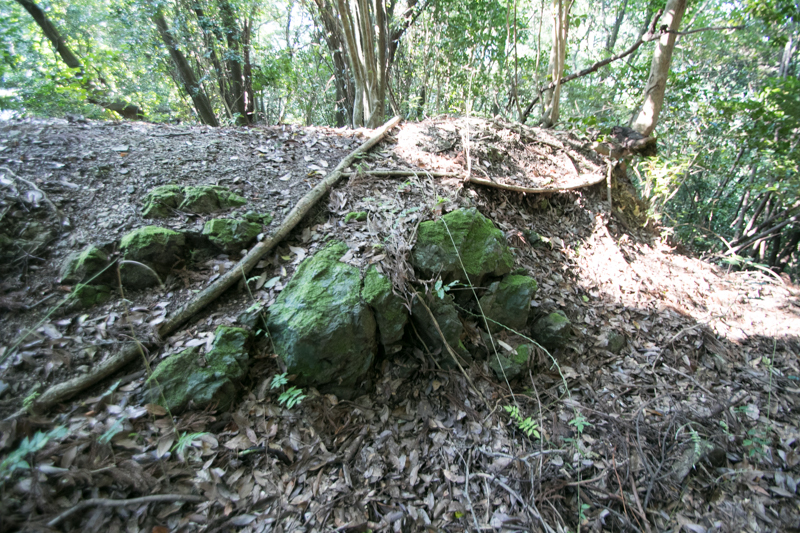 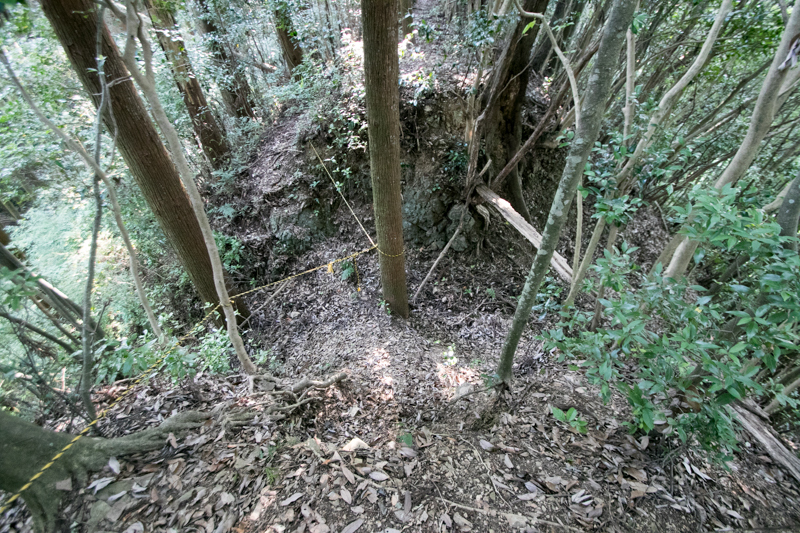 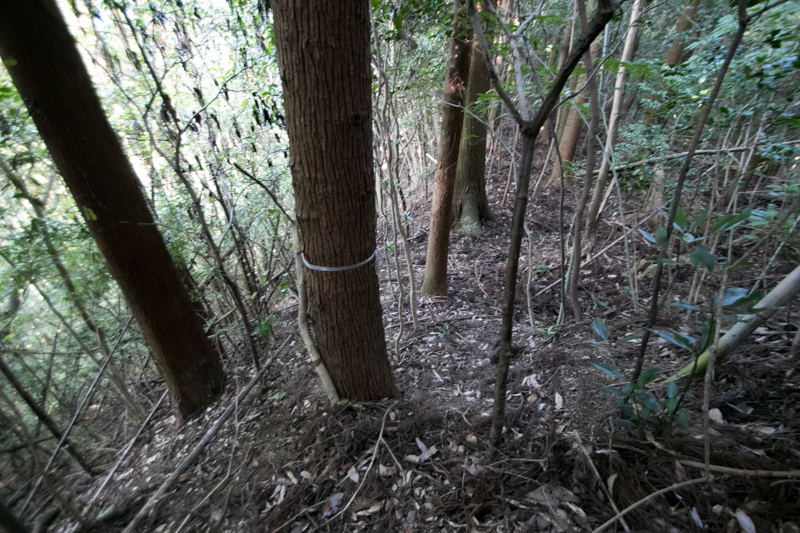 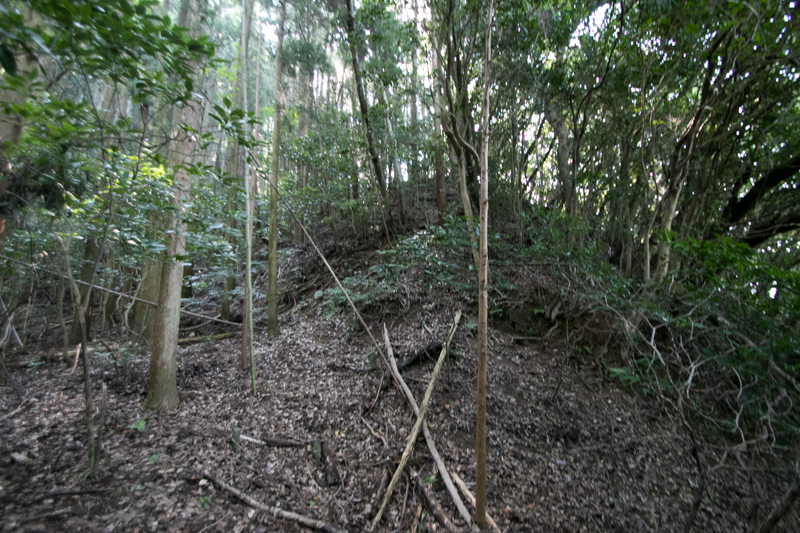 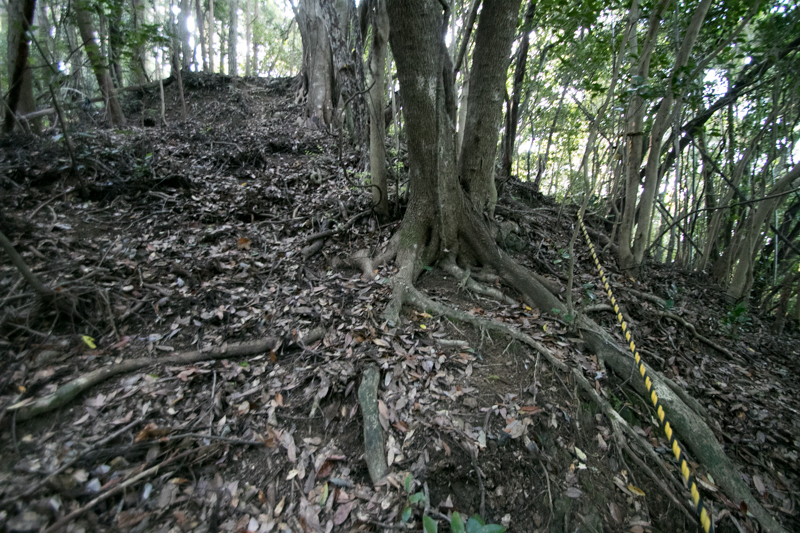 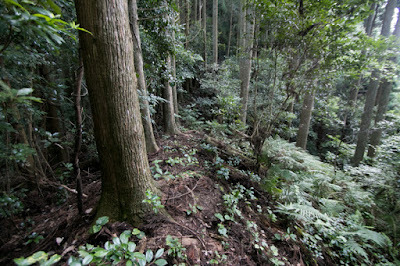 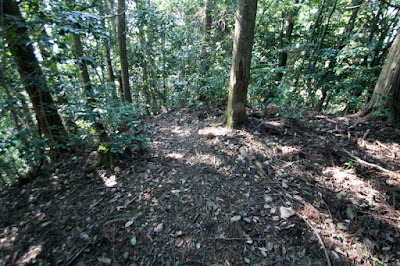 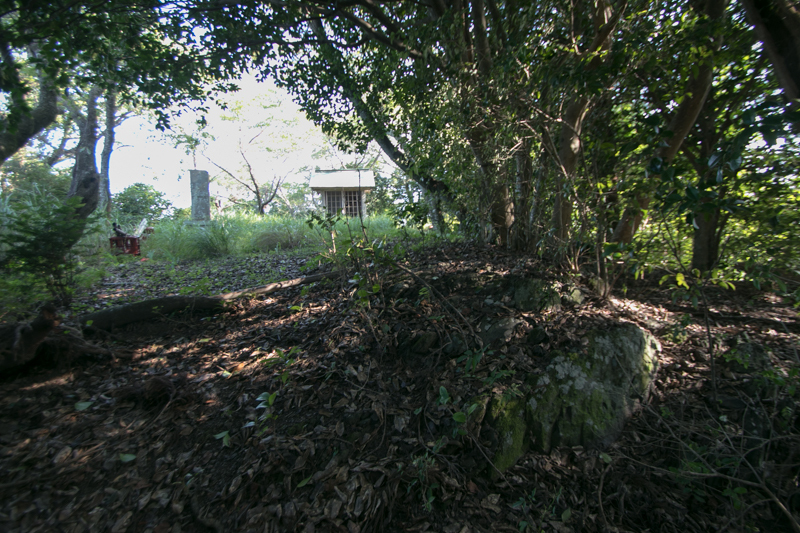 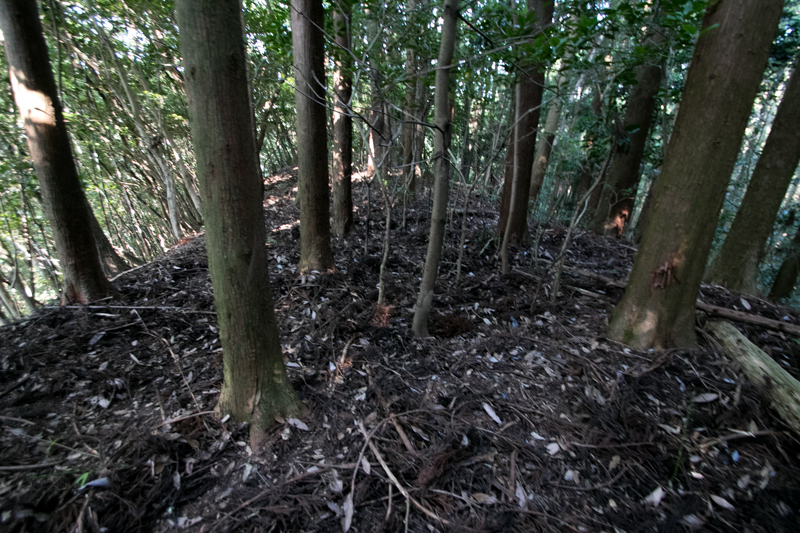 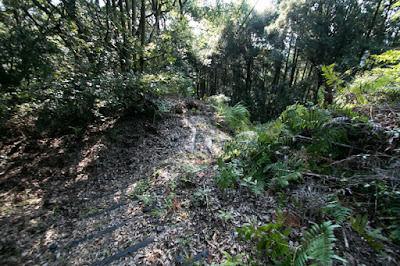 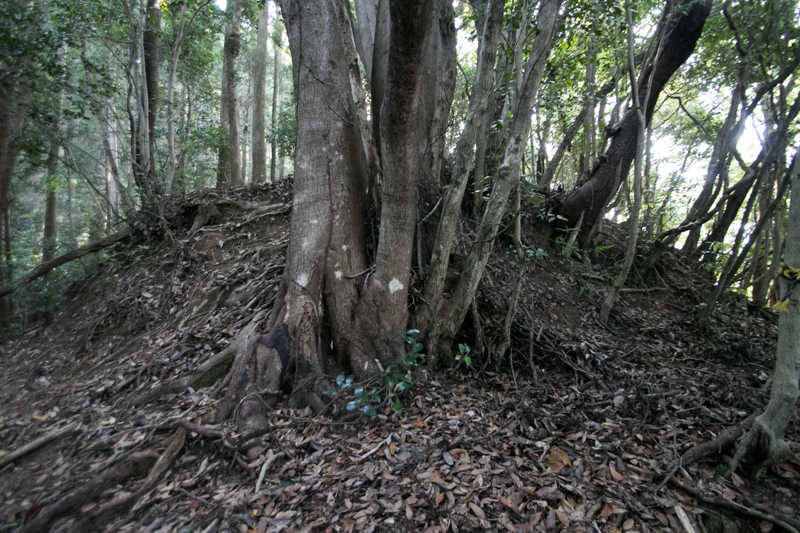 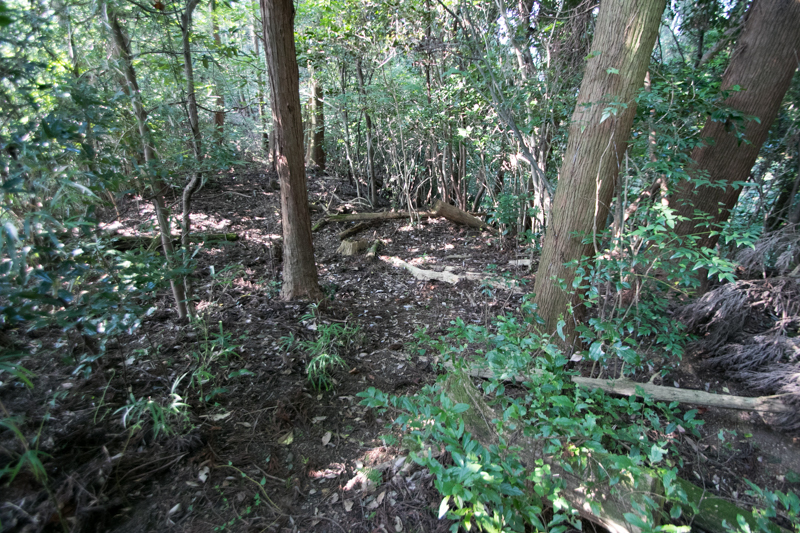 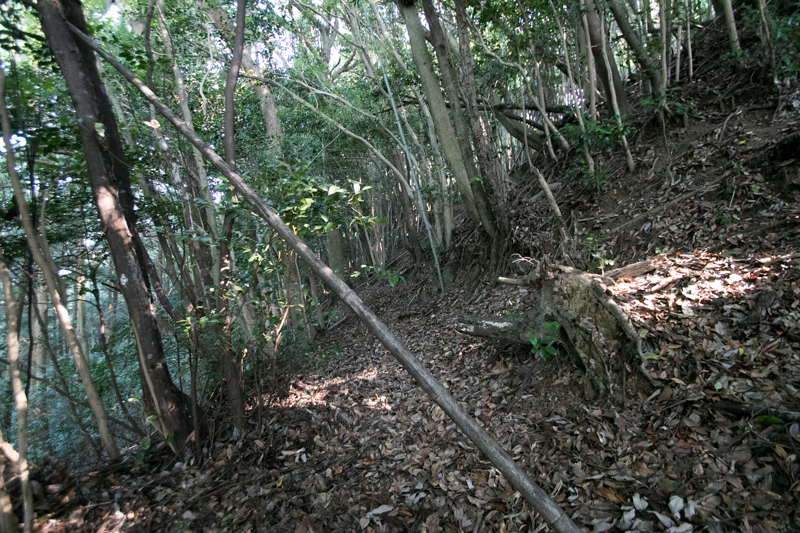 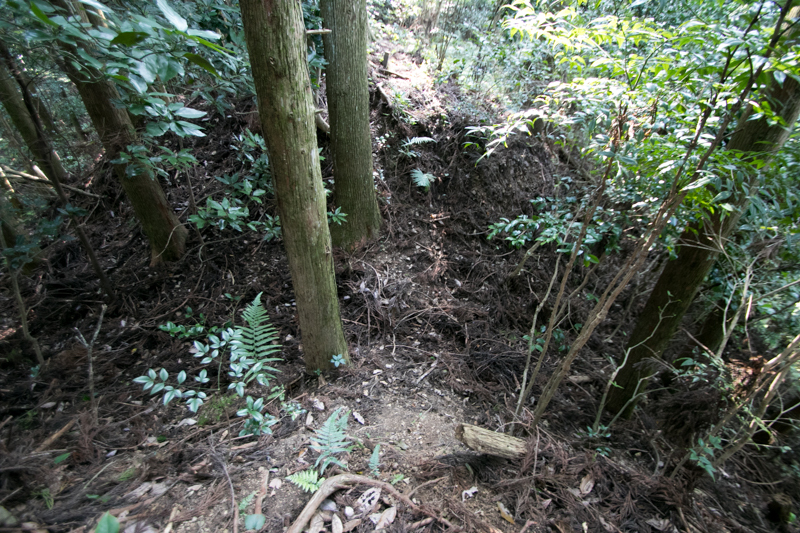 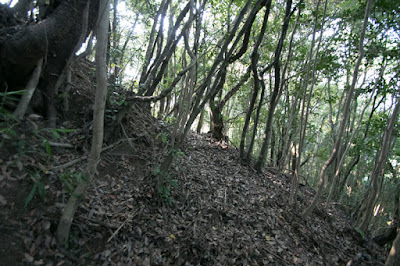 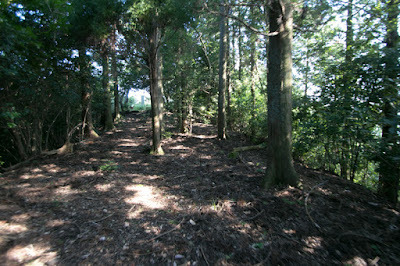 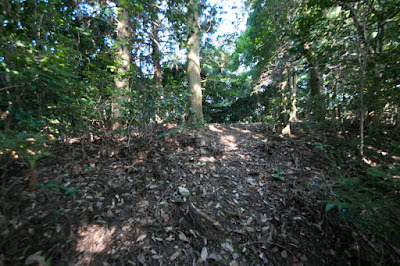 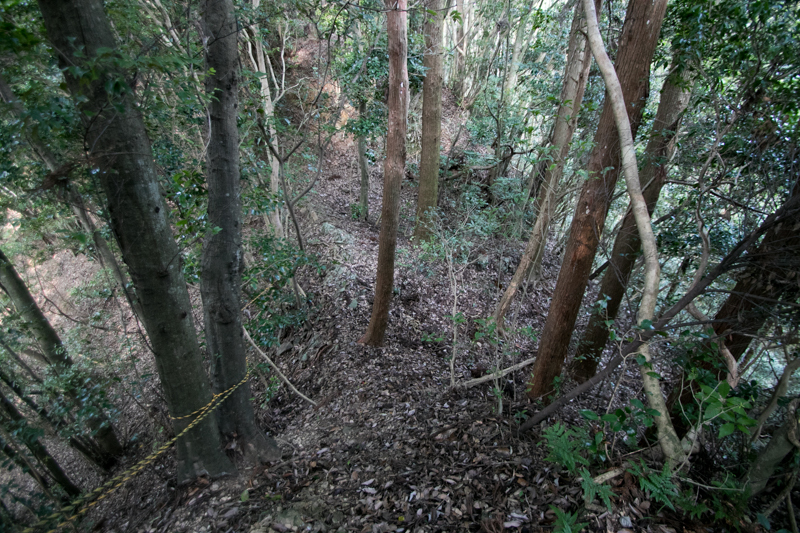 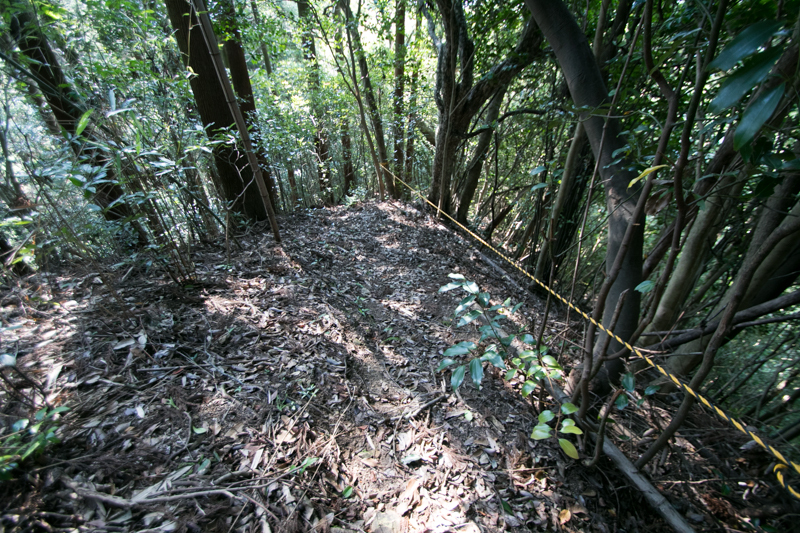 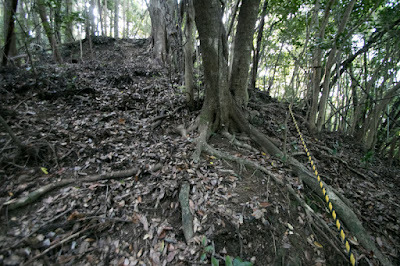 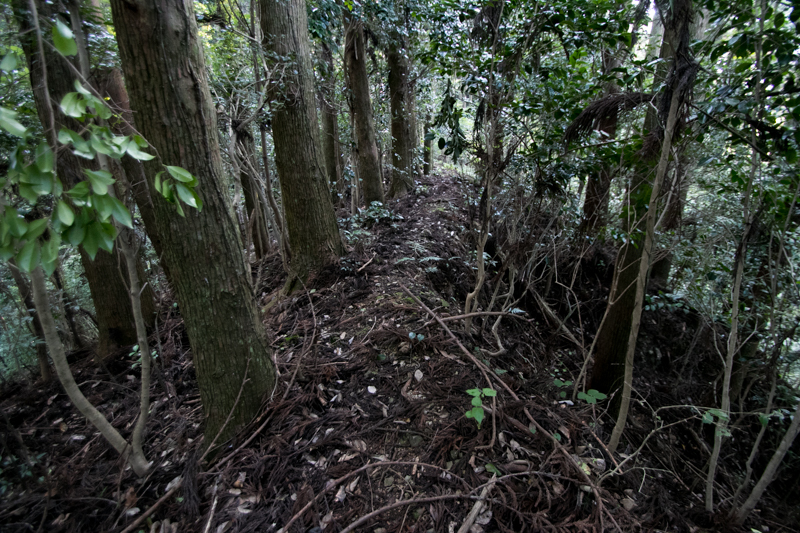 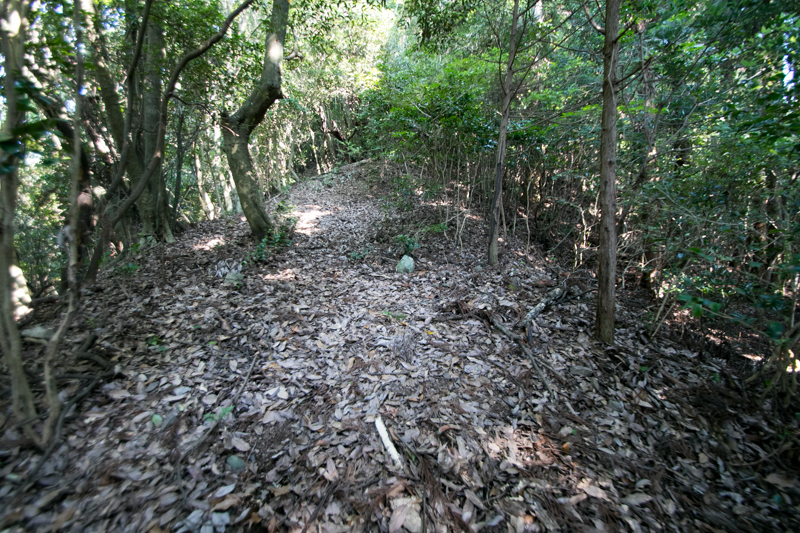 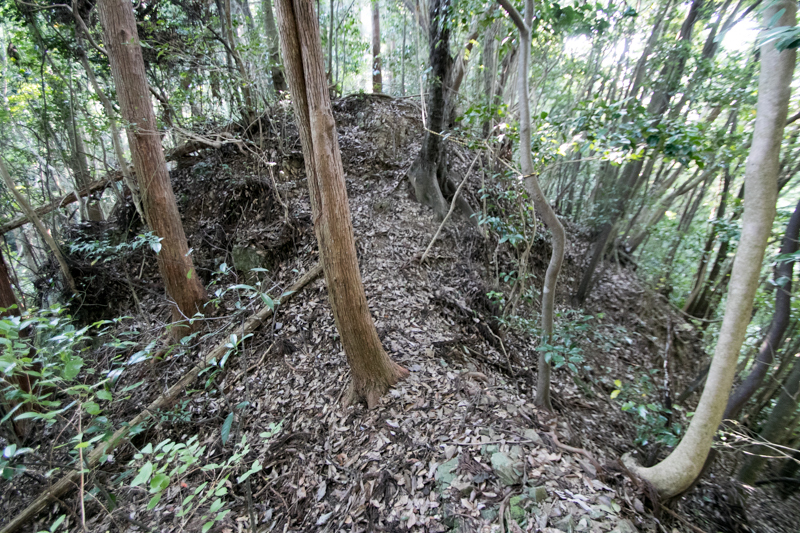 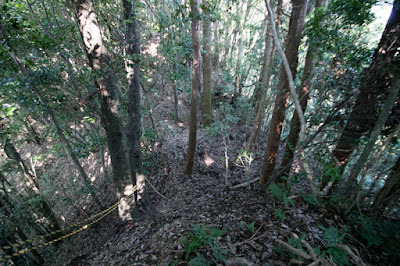 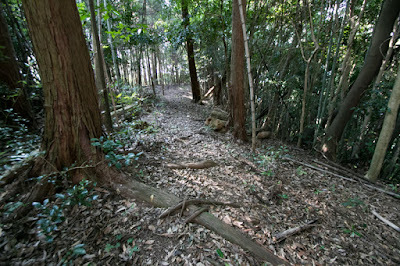 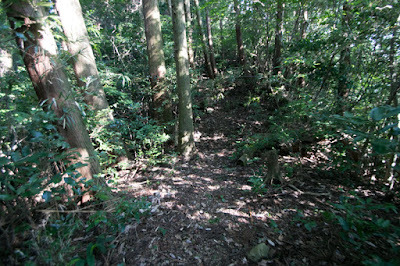 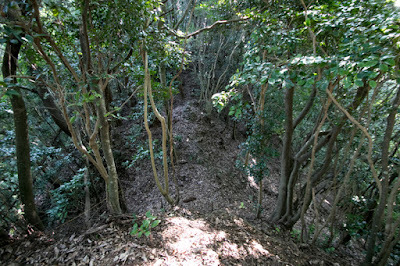 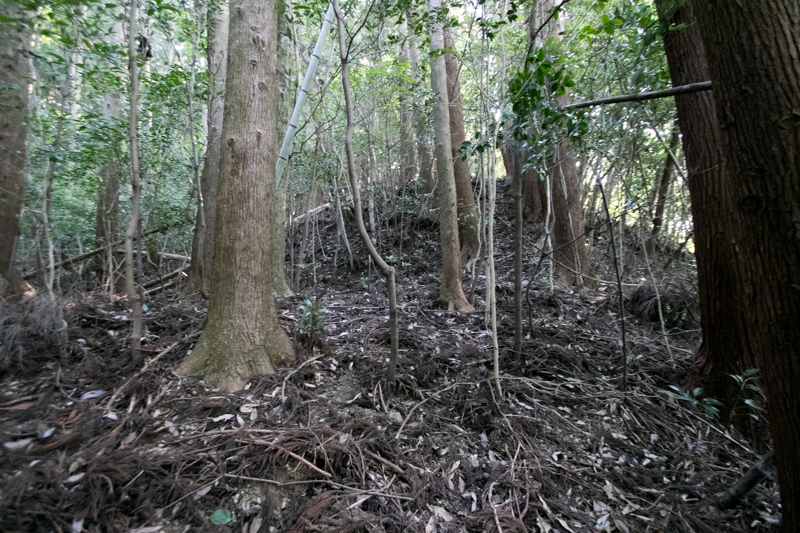 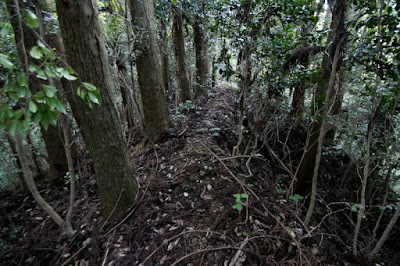 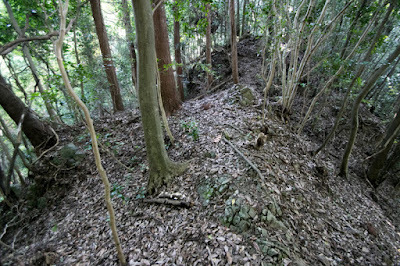 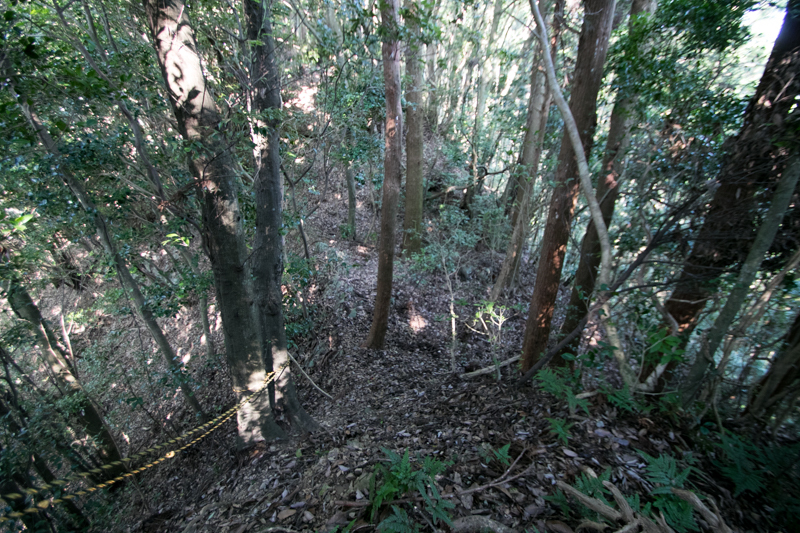 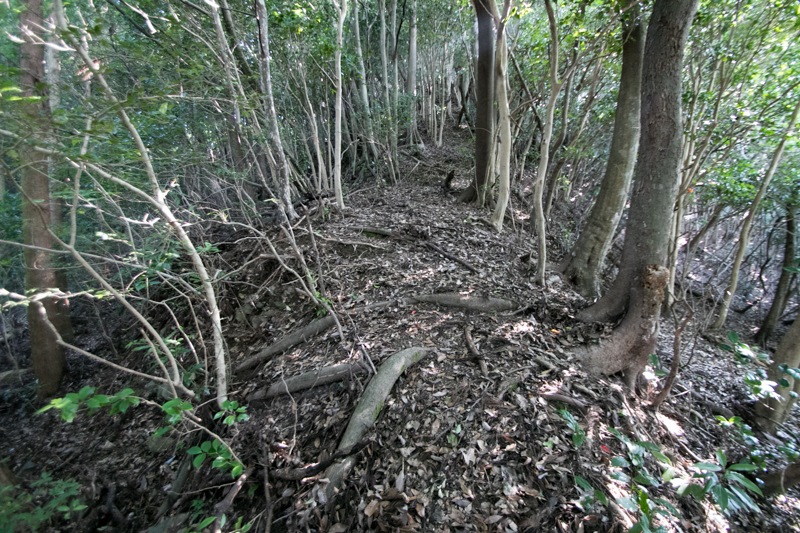 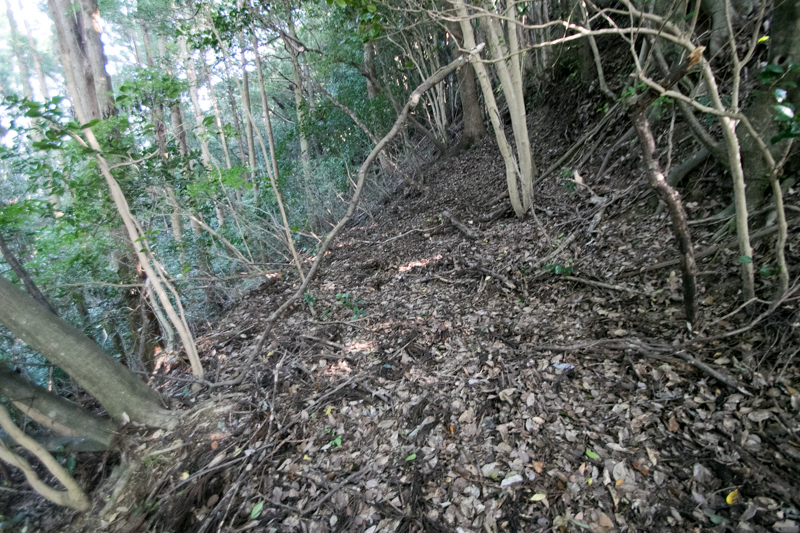 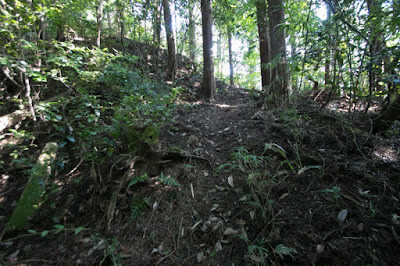 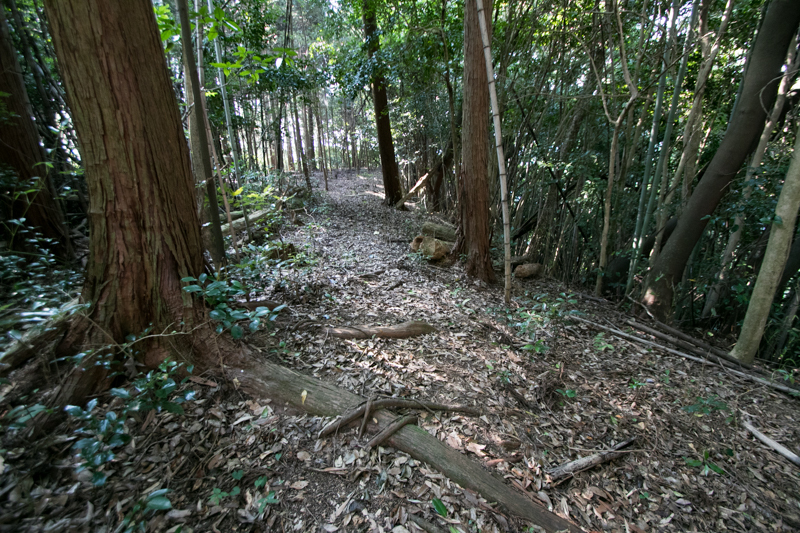 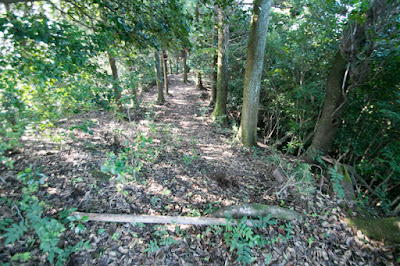 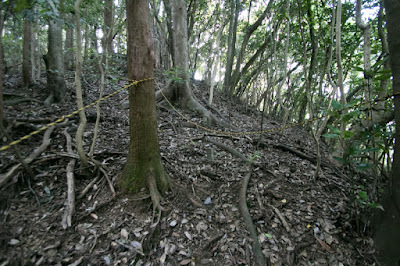 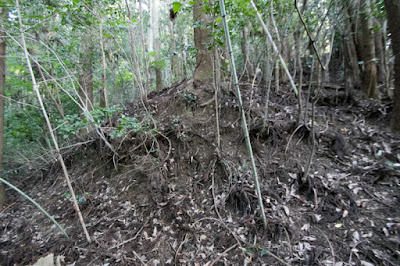 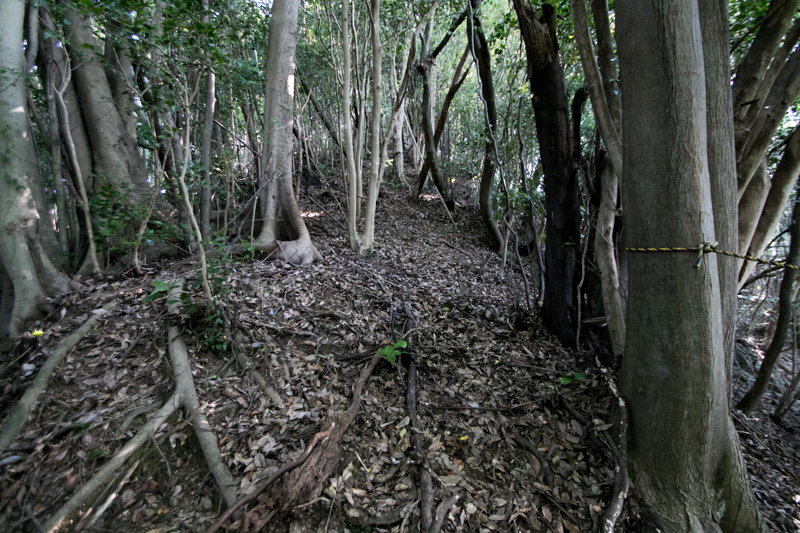 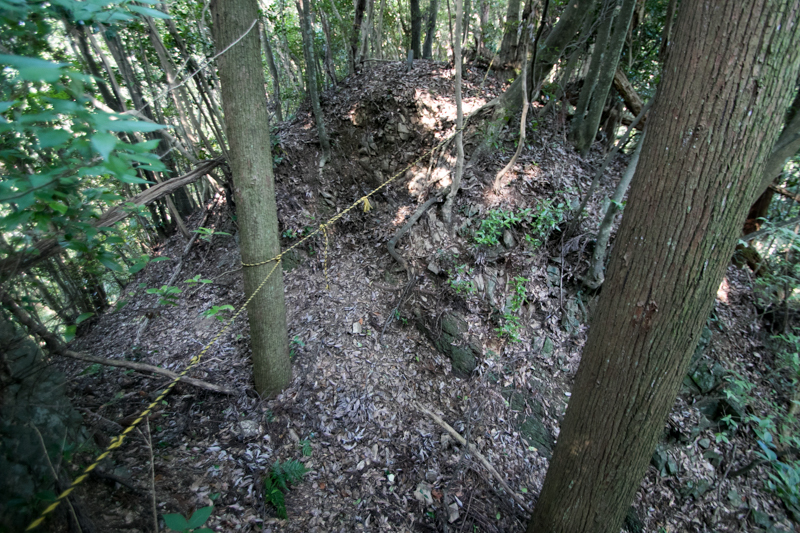 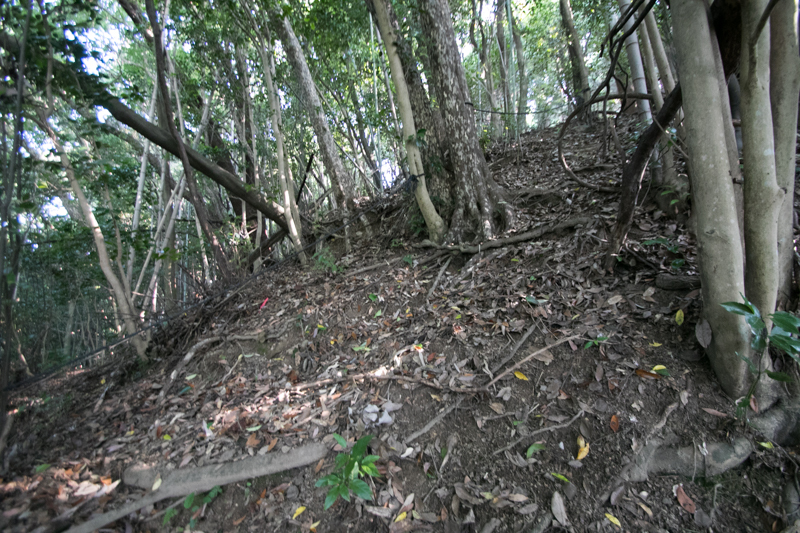 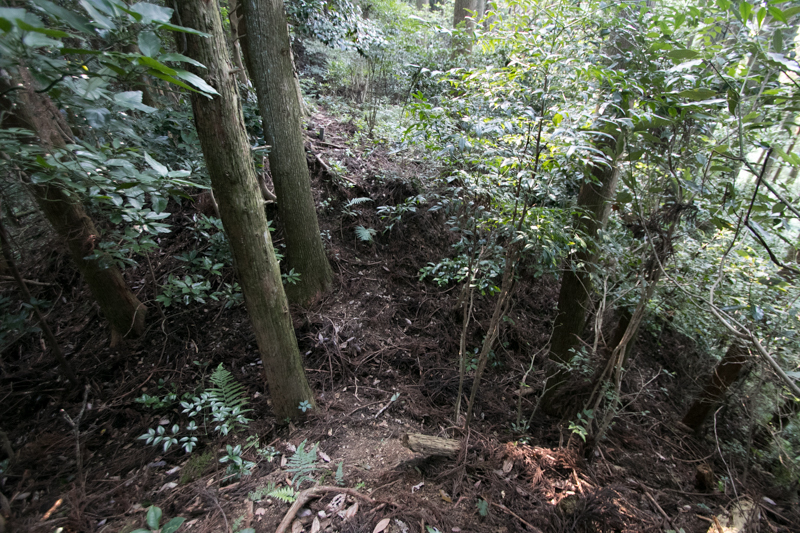 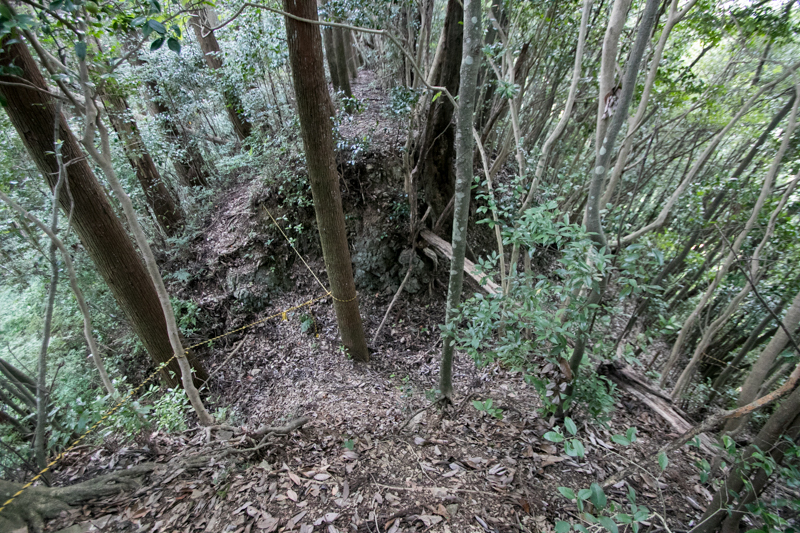 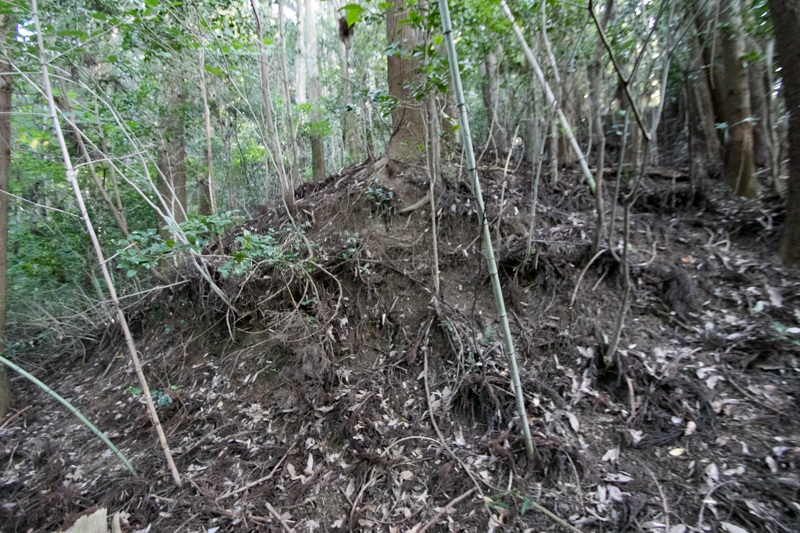 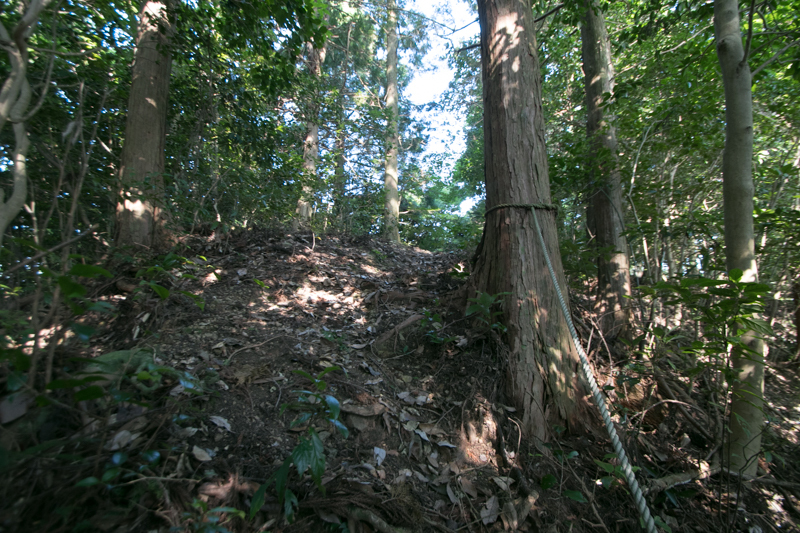 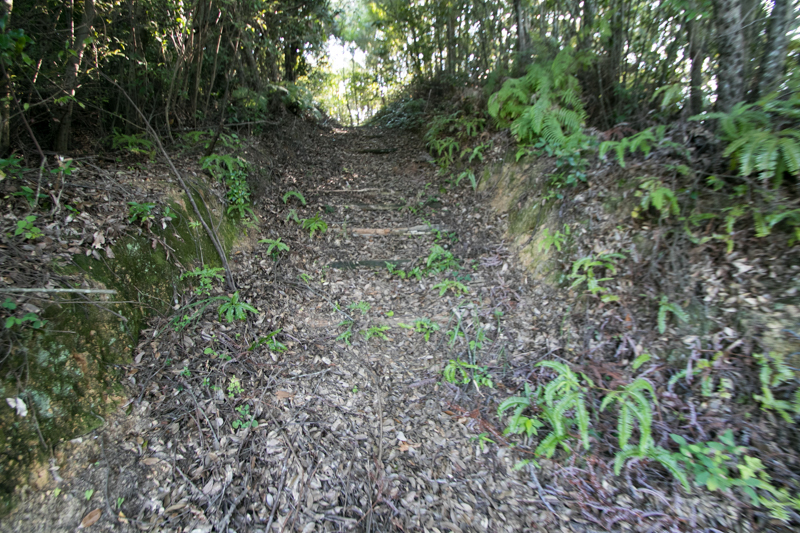 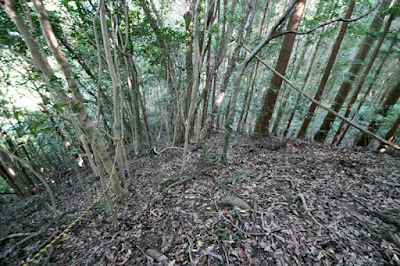 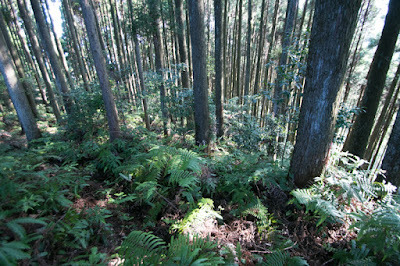 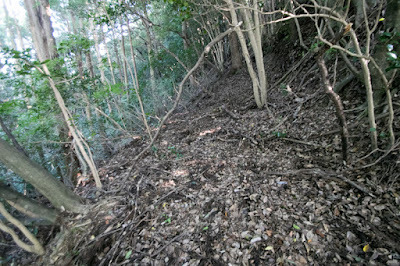 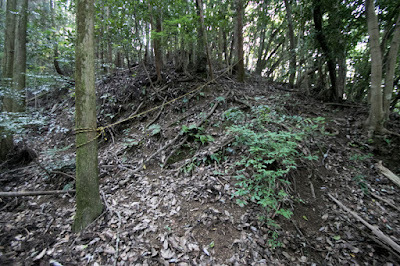 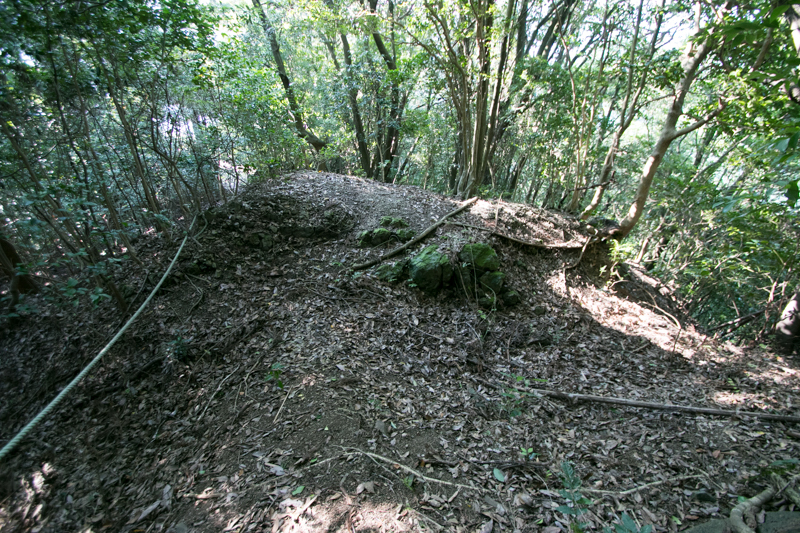 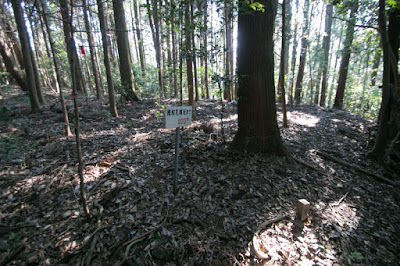 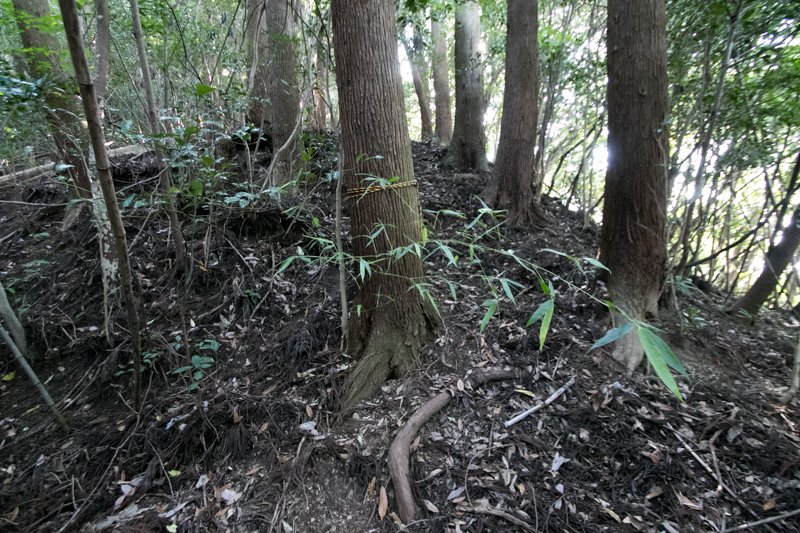 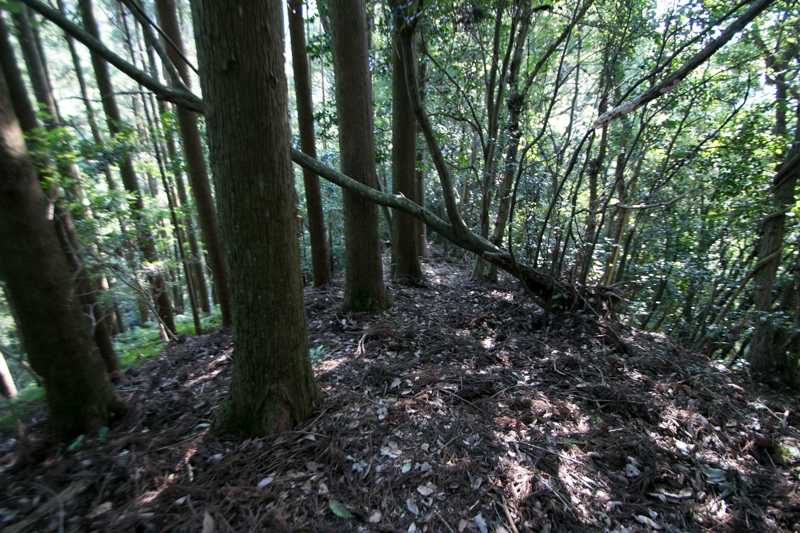 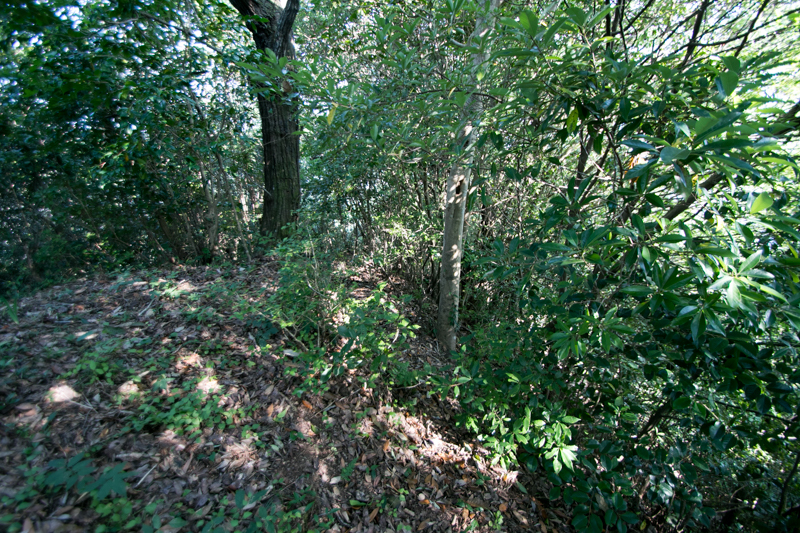 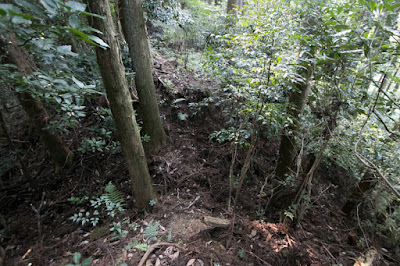 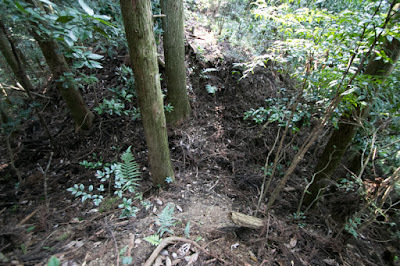 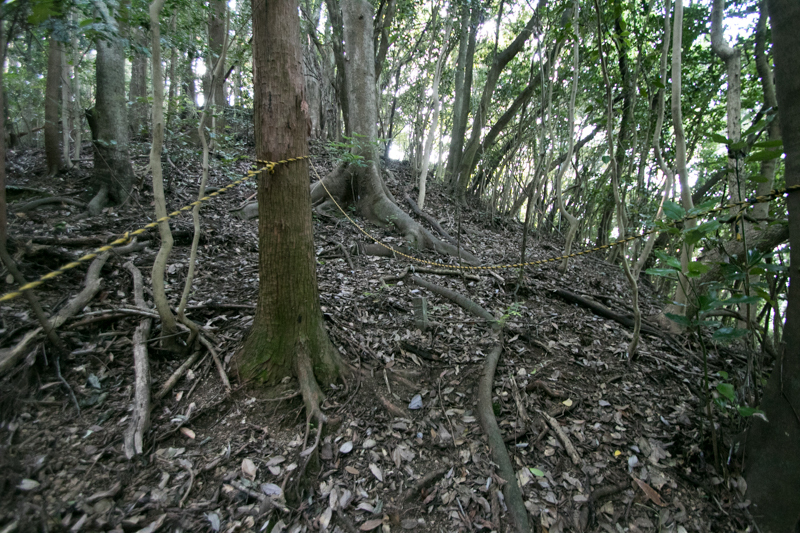 However, southwestern hills was still a weak point of the castle, a front fort was built preparing for Shimazu army. 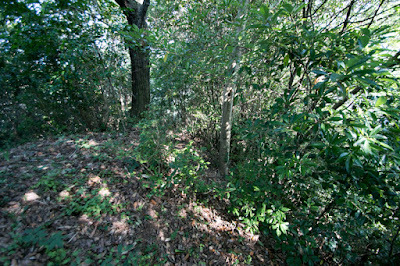 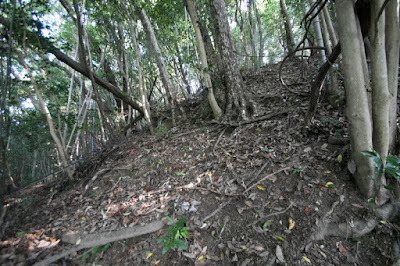 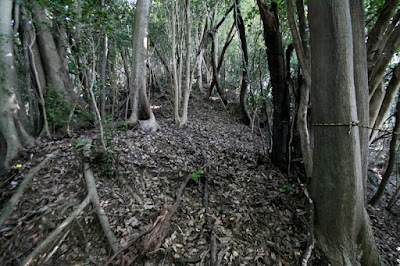 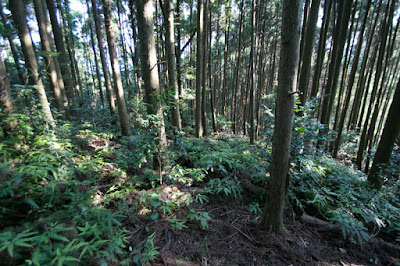 Because of limitation of time, the main part of the fort is just a flat area of about 100 meter long and 20 meter wide. 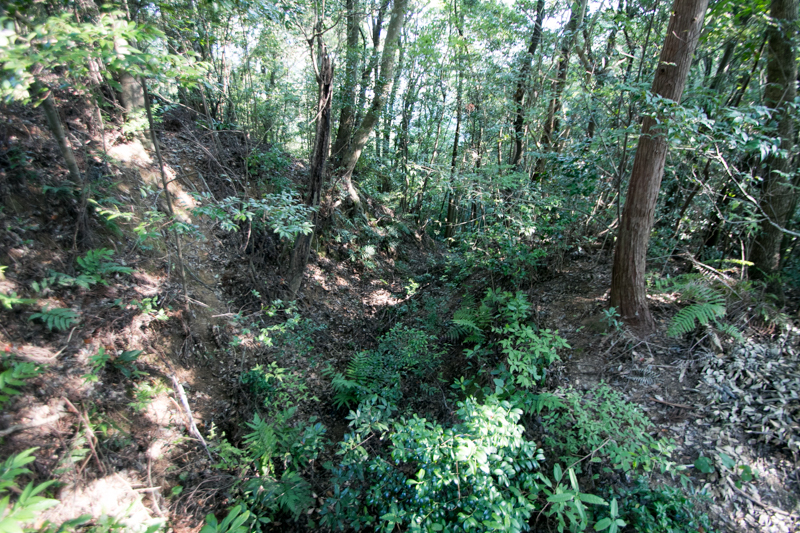 But the edge of the area is securely protected by the combination of horizontal dry moat and vertical dry moats. 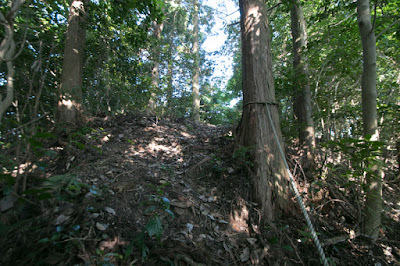 Total length of the castle exceeds over 500 meter, and suitable as an important border castle. 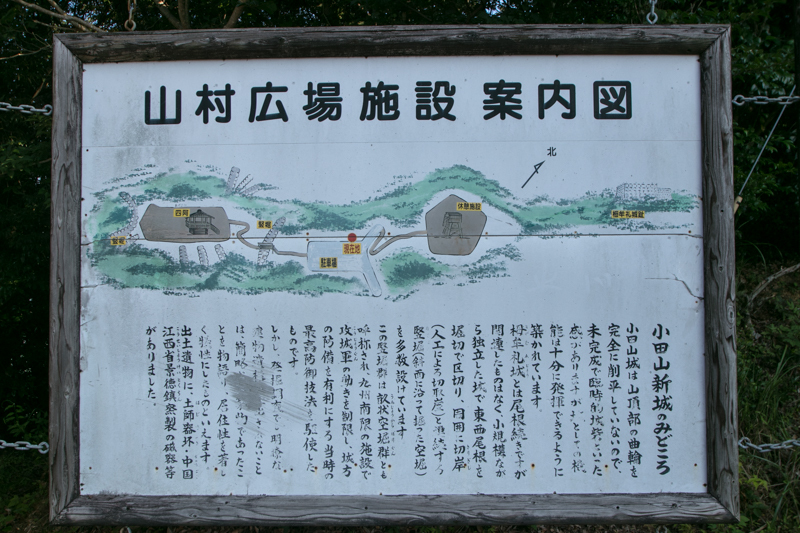 In November, Iehisa Shimazu sent 2,000 soldiers to attack Saeki army. 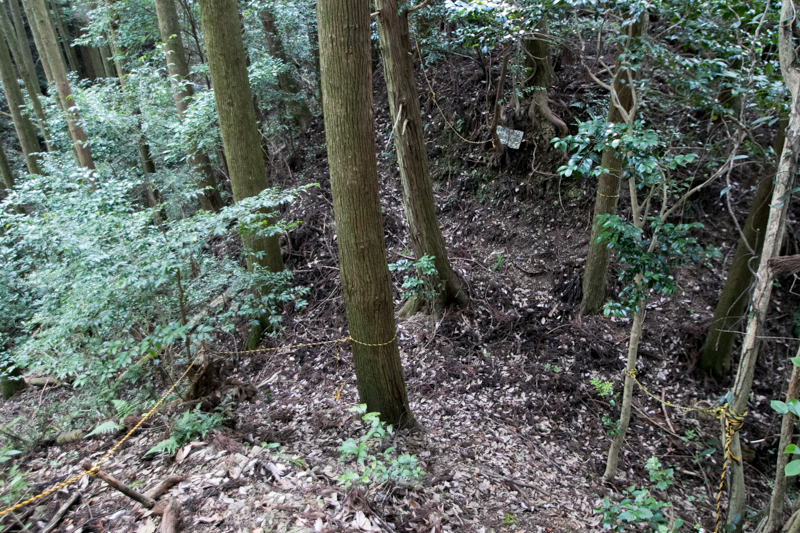 Looking at the march of the enemy, Saeki army decided to intercept at Katada area, a narrow valley formed by Katada-gawa river and Ogoe-gawa river. 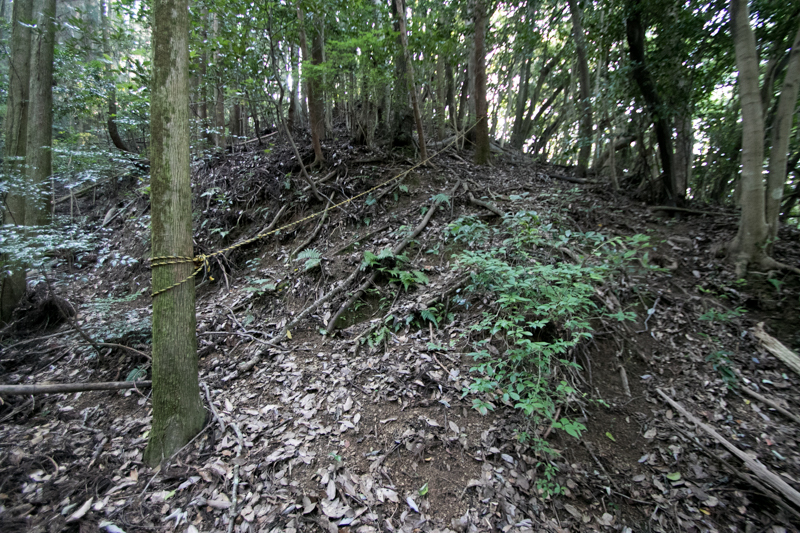 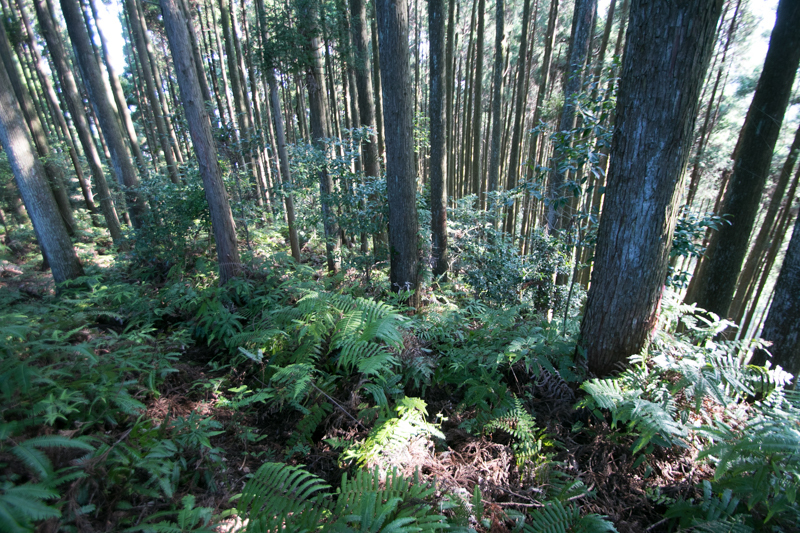 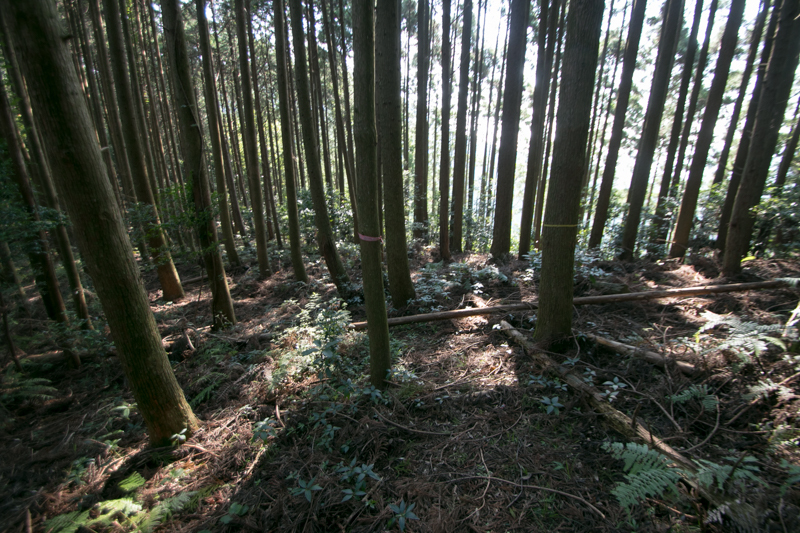 Saeki army only had less than 1,000 soldiers, but well knew the terrain of the area then Munemasa Yamada hided troops at various place of the valley. 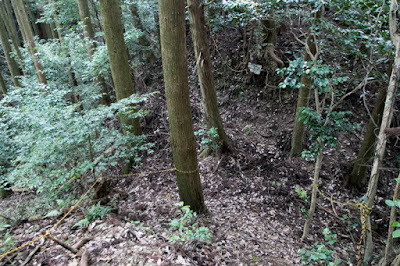 At the actual combat of Saeki Army and Shimazu army, hidden Saeki army suddenly attacked Shimazu army from backside. 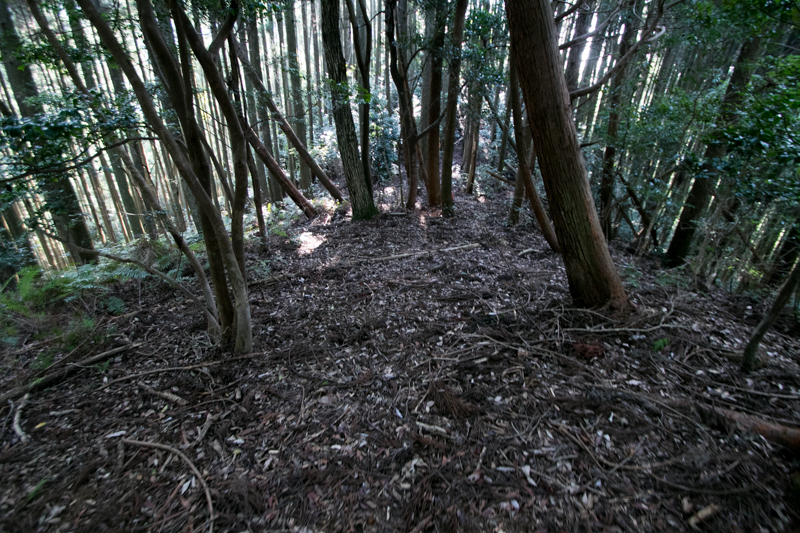 As Saeki army pretended to be a large army, frightened Shimazu army tried to retreat to restore the situation. But Saeki army attacked retreating Shimazu army by hidden troops, then finally Shimazu army collapsed and run away. Because of this victory, Iehisa Shimazu did not attack Saiki area again and use different mountainous route for invasion. 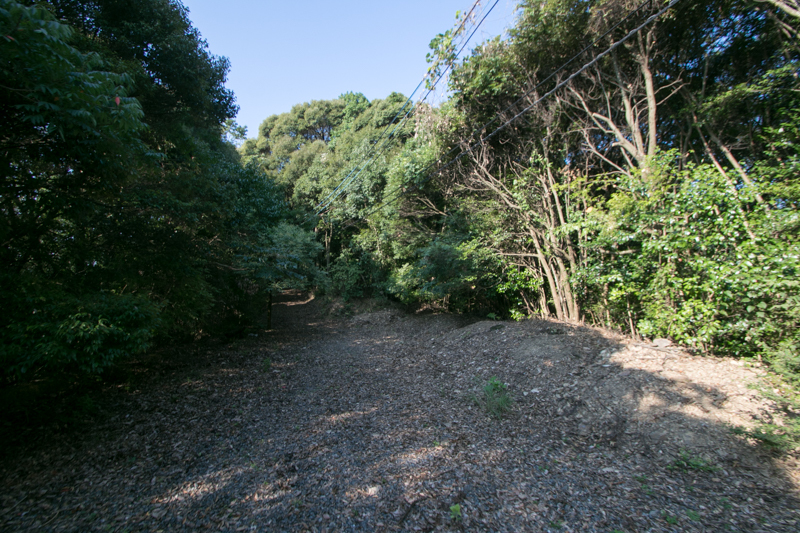 But as Saeki army shut the closest land road and marine transportation, supply line of Shimazu army was significantly obstructed. 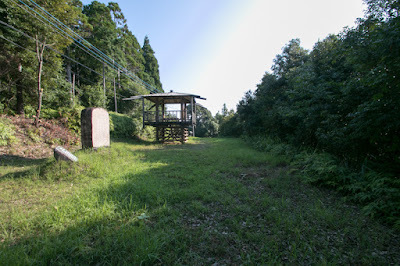 Furthermore, at the retreat of Shimazu army from Bungo province next year, Koresada Saeki chased retreating Shimazu army and gave a certain damage then deprived a valuable tea utensil held by Yoshihisa Shimazu. 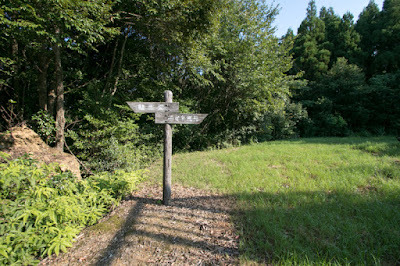 After the surrender of Shimazu clan, Yoshimune Otomo was once approved as the feudal lord of Buzen province but was expelled by its failure in 1593. 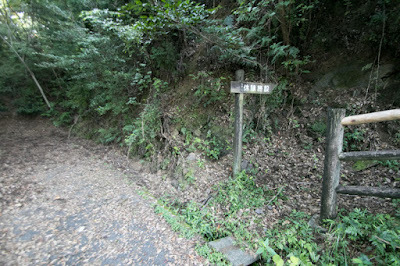 Koresada Saeki also lost his territory, but being supported by his fame Koresada was hired by Takatora Todo (1556-1630). 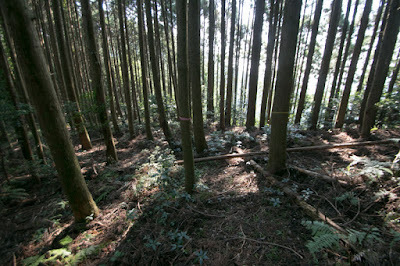 Koresada activated at many battles and finally became an important retainer of Tsu domain. 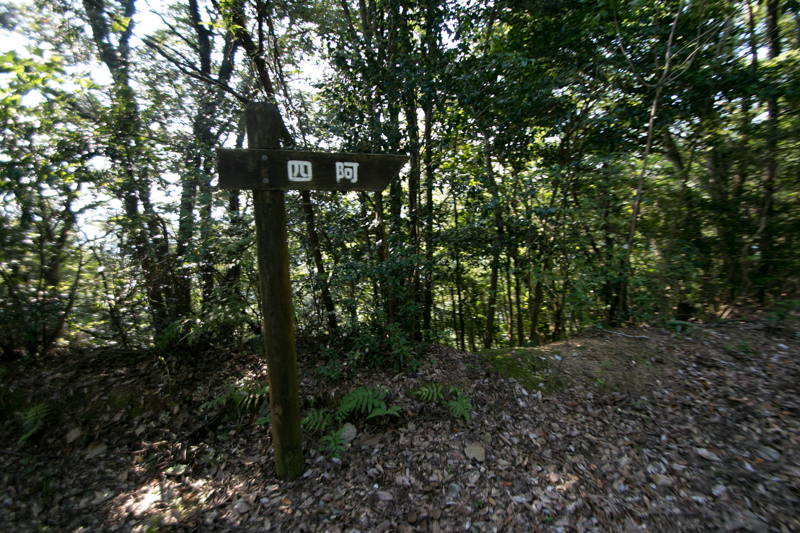 In 1594, Takamasa Mouri (1559-1628) who was the close retainer of Hideyoshi Toyotomi became the lord of Saiki area, along with Hita area and Kusu area. 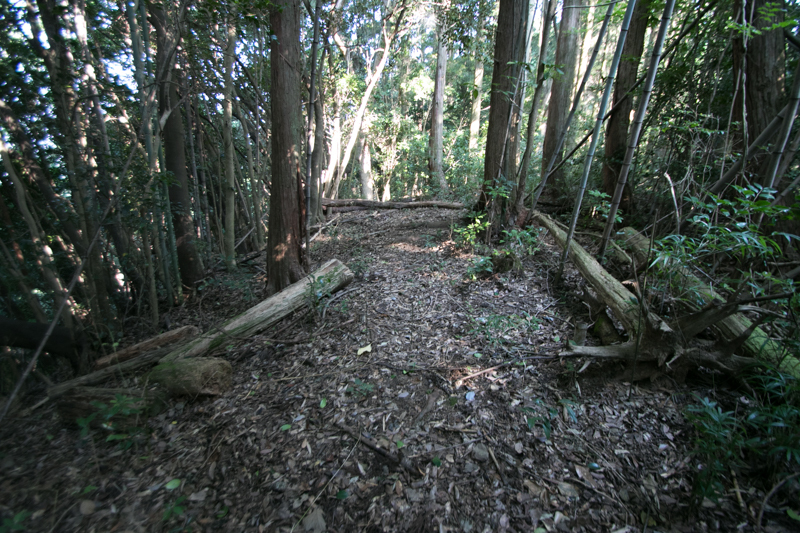 After the battle of Sekigahara occurred in 1600, Takamasa became the lord of only Saiki area in 1601. 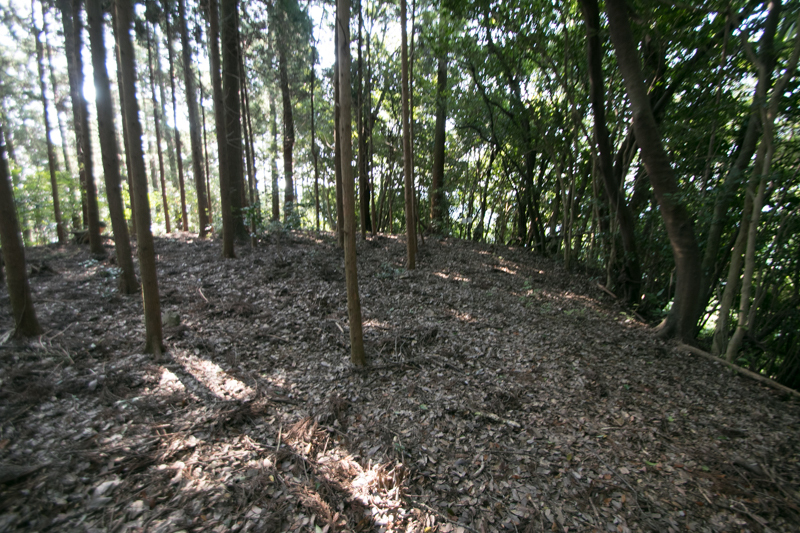 As Togamure castle was an old style castle and inconvenient at inland area, Takamasa newly built modern style Saeki castle then Togamure castle was abolished at this time. 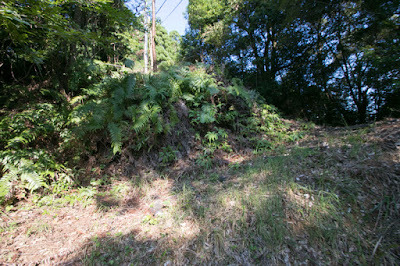 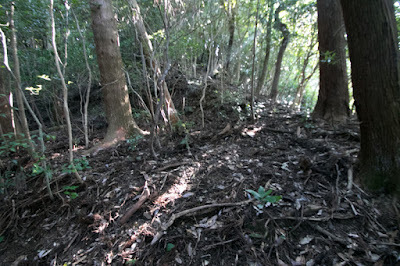 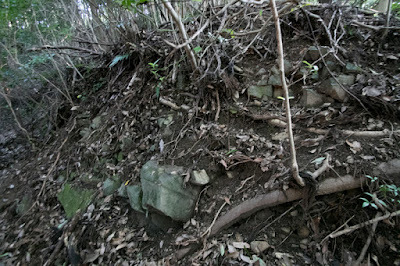 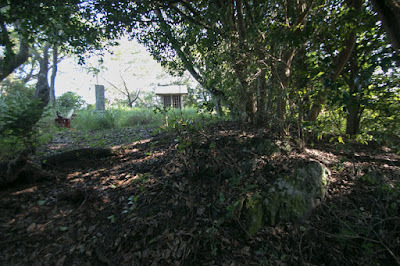 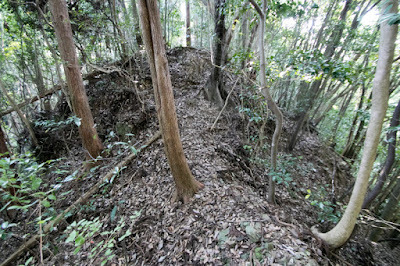 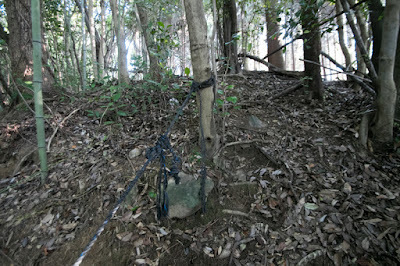 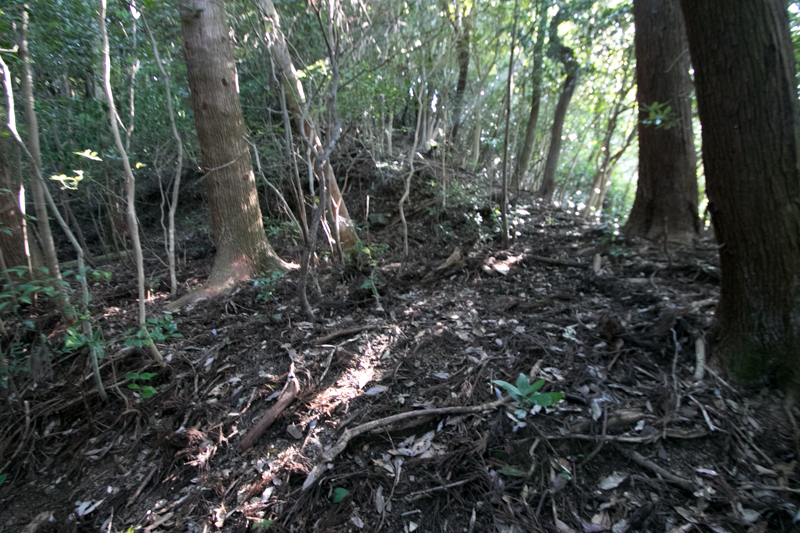 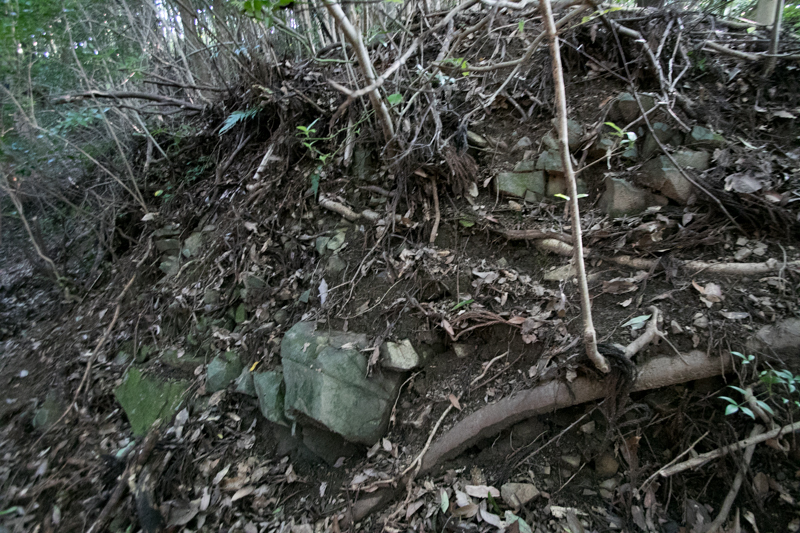 Now no building remains but structure of the castle remains on the mountain covered by bush. 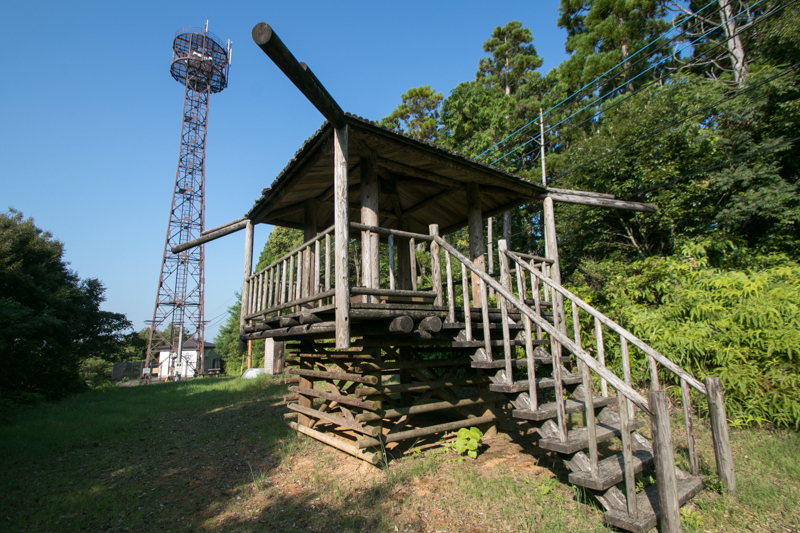 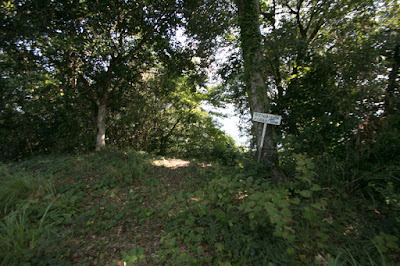 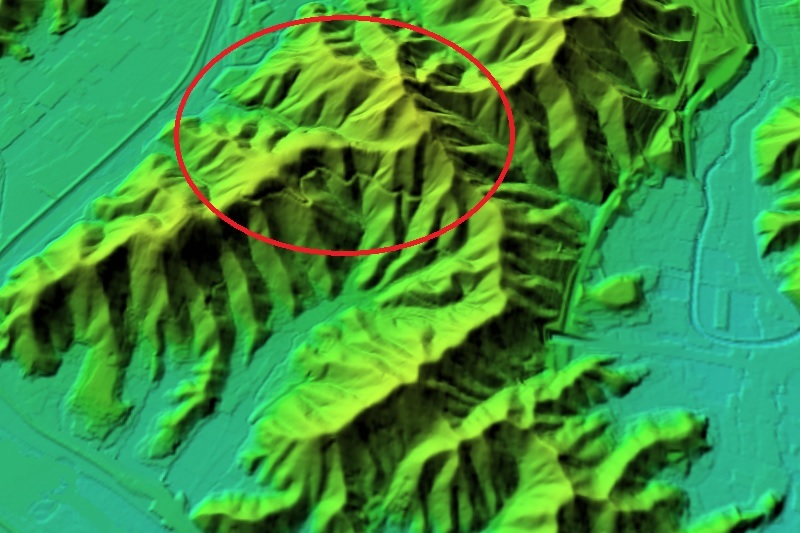 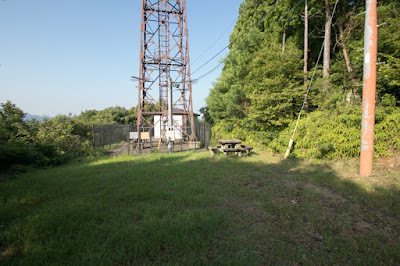 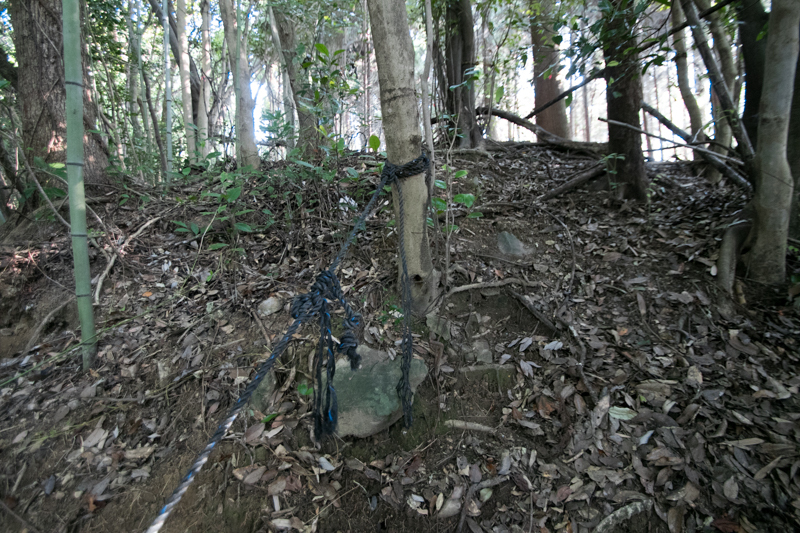 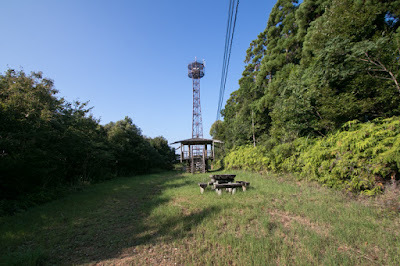 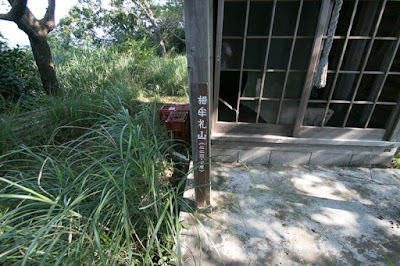 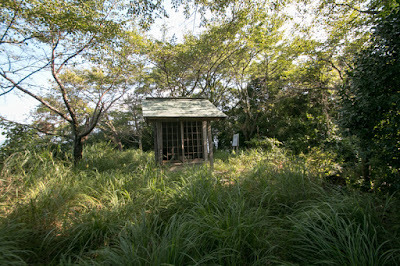 Togamure mountain is surrounded by national roads and highway, and this shows castle site is still an important area of communication. In spite of its traditional planning, its scale and defense structure might be sufficient to face with even superior army. 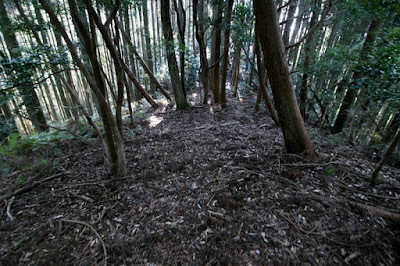 Being supported by secure Togamure castle as a last resort, Saeki army could adopt bald tactics and beat strong enemy. 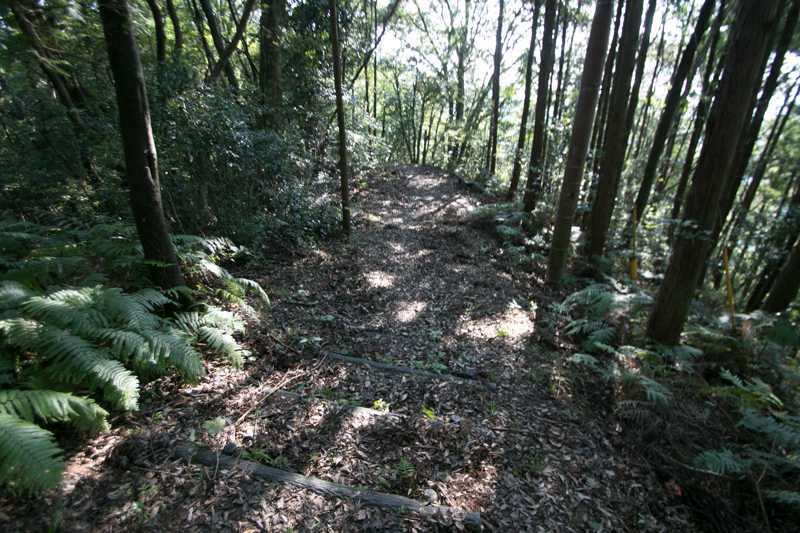 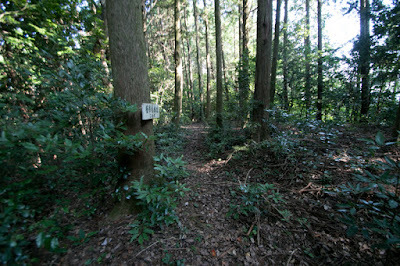 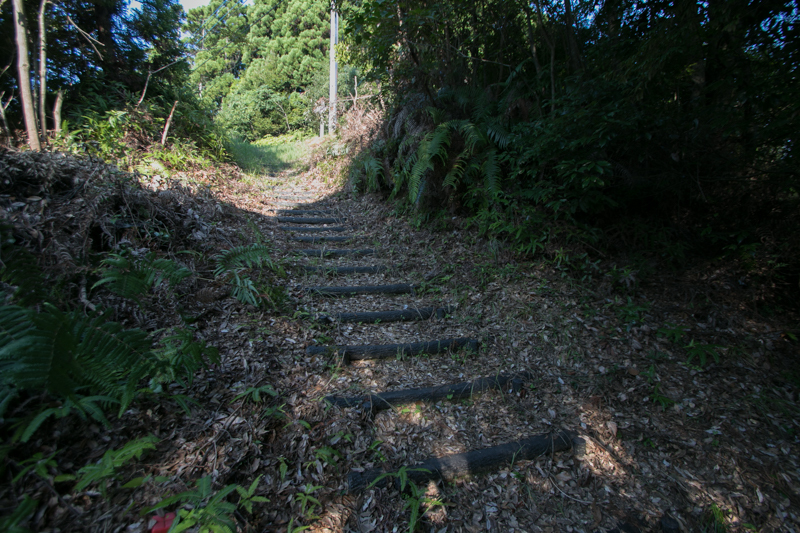 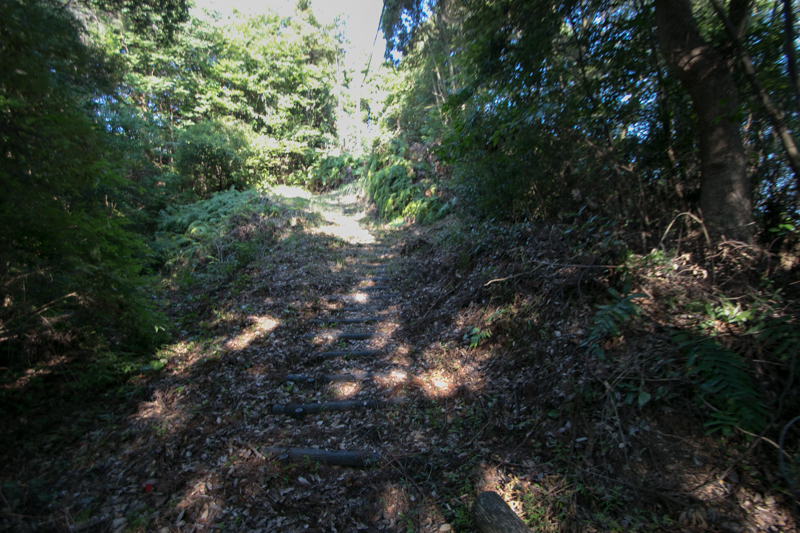 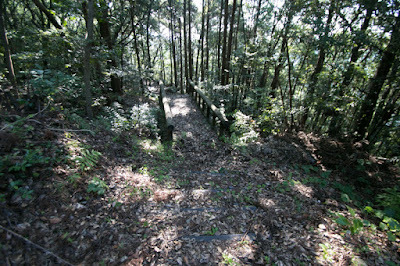 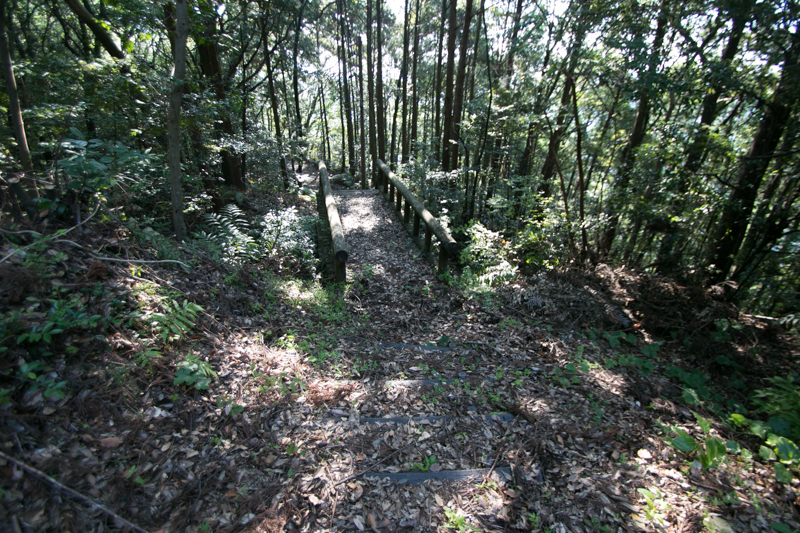 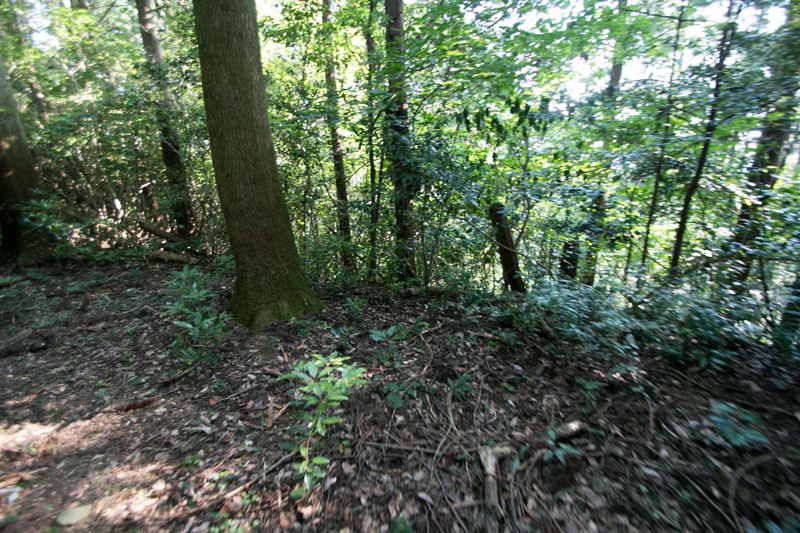 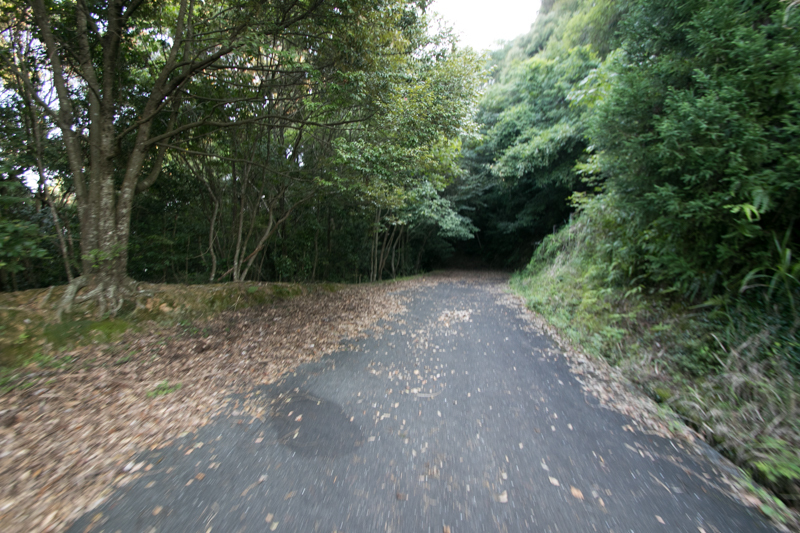 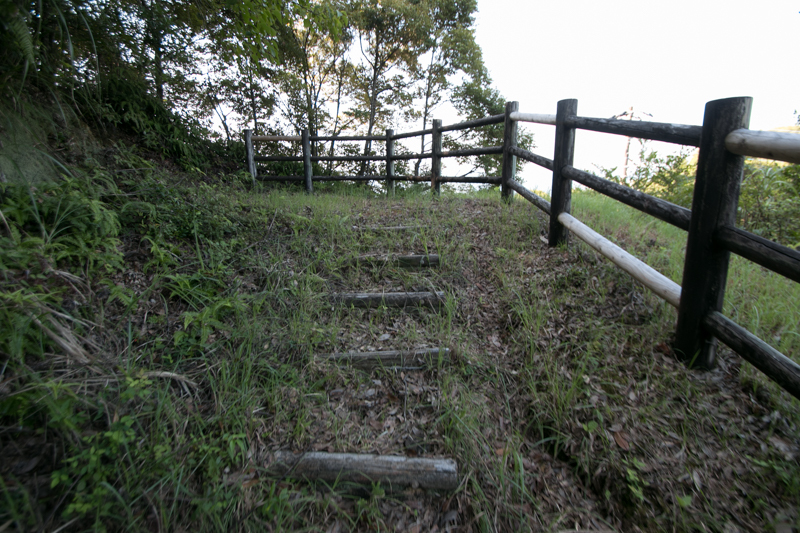 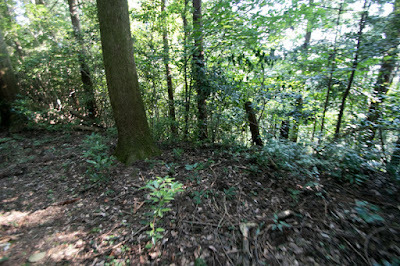 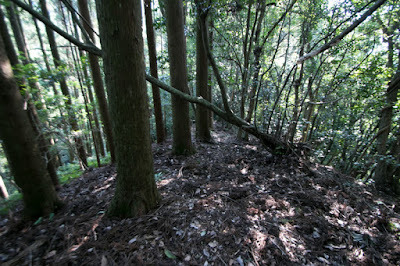 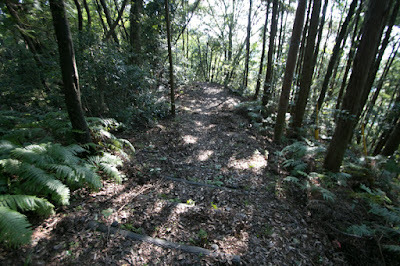 20 minutes walk from JR West Nippo Honsen line Kamioka station to entrance of climbing road. 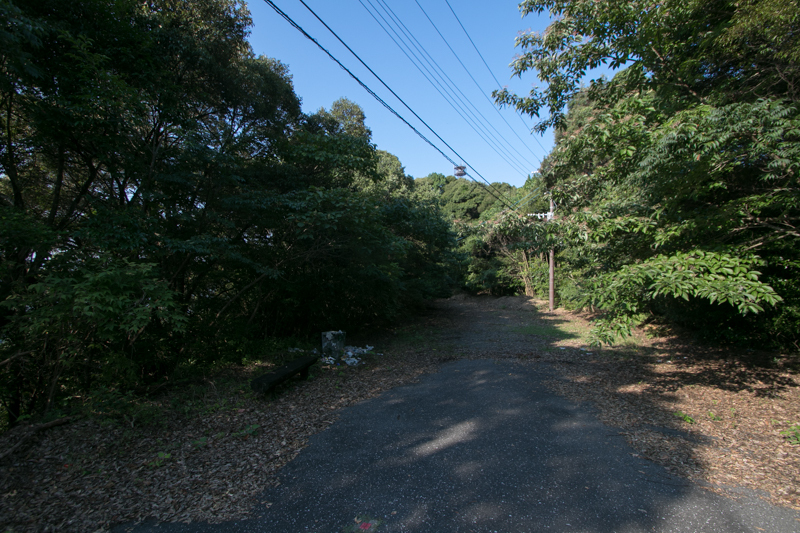 25 minutes drive from Higashi Kyushu Jidoshado Expressway Saiki interchange to halfway parking passing narrow forest road.